At the end of 2012 I made a list of all the books I read and published my first annual best books list. It was so fun that I’ve been waiting rather impatiently all year to write my next list. In 2012 I read just over 50 books, though I’m sure I forgot some while I was making my list. I knew I could read more than that (there’s a lot of down time in Peace Corps and I don’t have much of an active social life in the village) so I set a New Year’s Resolution to read 100 books. The numbers are finally in and my total count of NEW books read is 101*! On top of that I re-read some of my favorite series (and discovered audio books and how fantastic those are during bus rides or while I’m ironing). I re-read 21 books so, if you add those, that means I read 122 books during 2013. Needless to say, I had a lot of options to choose from and after careful consideration, I narrowed it down to the ten best books I read in 2013 (with a couple honorable mentions, of course). Enjoy! 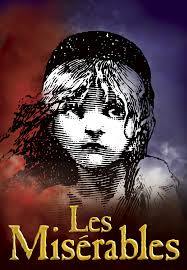 Fiction Les Misérables – Victor Hugo This was one of the first books I finished in 2013. I’ve wanted to read this classic for a long time and I finally got around to it, spurred on by the fact that I wanted to watch the new movie. Despite its vast length and frequent sideline commentary on topics such as how the France could have become rich if it had diverted its sewer system so human waste could become manure to fertilize the land, etc, etc, the story was brilliant. There’s a reason it’s such a classic. The themes of redemption, love, honor, and sacrifice make it a story worth reading (or watching) again and again. 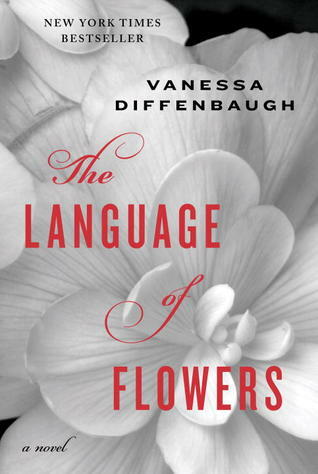 The Language of Flowers – Vanessa Diffenbaugh This is a book that popped up again and again, and I’m glad I finally read it. The story is based on the life of Victoria Jones, a hardened 18-year-old foster kid who has moved from home to home countless times throughout her young life. She’s just about to age out of the system and she doesn’t have a plan or a place to go. The book contains frequent flashbacks to Victoria’s younger years when she lived with her foster mother Elizabeth. At first all seems well between the two but there are several hints of something tragic that occurred to cause a separation between Elizabeth and Victoria. Meanwhile, 18-year-old Victoria comes to the attention of a florist who makes it her mission to help her. Victoria becomes a florist assistant and starts learning the language of flowers, a Victorian-era tradition. Along the way, she meets a boy who is determined to get to break down the walls she has built around herself. Diffenbaugh’s writing style is a little jarring at first as she jumps back and forth across the years, but the story finally converges with a message about the meaning of family. I enjoyed it. 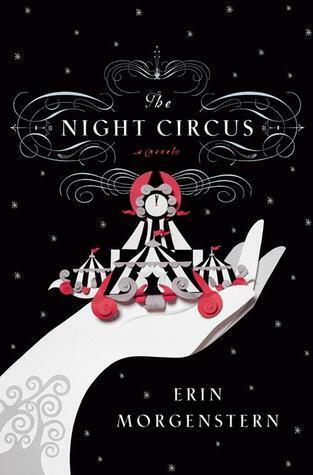 The Night Circus – Erin Morgenstern This break-out novel for Erin Morgenstern was my favorite read of 2013. It included elements of magical realism, which I have a great fondnesss for, and it reminded me of one of my favorite movies: The Illusionist. The circus that is featured in the novel is a (magical?) wandering black-and-white circus that is only open from sunrise to sunset. Visitors to the circus believe that the performances are all incredible illusions, but are they? Underneath the surface of mystery and enchantment, there is a deeper plot as two magicians use their protégés to wage a secret battle of skill and style as each creates more complex and astounding magical illusions. The stakes are high for the two protégés – the loser will die. Fate steps in as their paths intertwine and the reader is whisked away for an enchanting ride. 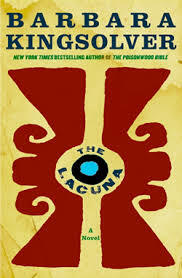 The Lacuna – Barbara Kingsolver Barbara Kingsolver does it again. I haven’t yet read a book by Kingsolver that hasn’t moved me. I finally read The Poisonwood Bible this year and that was also a candidate for best books but I decided to go with a lesser-known Kingsolver novel. This work of historical fiction focuses on the live of Harrison William Shepherd, a fictional plaster-mixer turned cook turned author. Though Shepherd is not a rela historical figure, he moves to Mexico where he lives with Frida Kahlo and her husband Diego Rivera. During the time that Shepherd lives with them as their cook, he also develops a friendship with Leon Trotsky who lives in the Rivera-Kahlo household during the time Stalin exiled him from Russia. As in all Kingsolver novels, the characters really came to life and it made me curious to study more historical accounts of these famous figures. 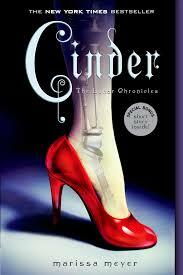 Cinder – Marissa Meyer Cinder is Marissa Meyer’s debut novel, a modern adaptation of the Cinderella story. This is not your typical fairy tale. Cinder is a cyborg – part human and part robot – a combination that is feared and hated in the dsytopian city of New Beijing post-World War IV. Cinder is a mechanic of some renown who comes to the attention of Prince Kai. Unfortunately, due to Cinder’s cyborg status she is a second-class citizen who is in danger of being sold by her stepmother as an experiment to science. The city is suffering from a plague and cyborgs are being drafted to be tested for a cure. Sure enough, Cinder’s stepmother volunteers her for the scientific experiment and Cinder is plunged into a plot of intrigue and danger. The story doesn’t end here – Cinder is the first book in The Lunar Chronicles. 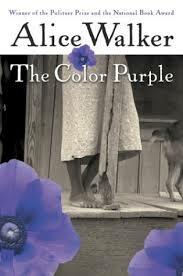 The Color Purple – Alice Walker A feminist classic, I read this book in one sitting. I laughed and cried. The characters experience love and loss, pain and betrayal, and it gripped me in a way that I truly did not expect. The story is set in the 1930s in rural Georgia. Almost all the characters are people of color and race, gender, and socio-economic status determine a great deal of how they are treated by those around them. There is heartbreakingly believable violence, especially towards women, and that makes it difficult to read but the books ends with a surprising note of redemption that sealed it forever as a book I will love. 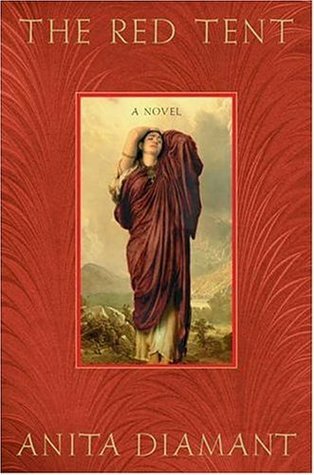 The Red Tent – Anita Diamant The Red Tent is a work of Biblical fiction, is a rather narrow genre that I haven’t explored a great deal. I didn’t have high expectations and I was pleasantly surprised. The Red Tent tells the story of Dinah, daughter of Jacob and Joseph’s sister. She’s only mentioned in the Bible on a couple of occasions but Diamant really develops her character, as well as those of her mothers, aunts, and siblings. Women are the primary characters and they are all strong characters. The Biblical account definitely focuses on the male figures and their actions, and I enjoyed reading a (fictional) account that portrayed the rich lives of the women who refused to let men determine their destinies. If readers are looking for a story that sticks strictly to the Biblical account, this is not it. The women worship other gods than Jehovah and Diamant isn’t exactly condemning that. Even after reading it several months ago, the story has stuck with me, and in my mind, that means it’s worth a read. Honorable Mentions: The Mitford series – Jan Karon Recommended to me by Amanda Banker (whose book recommendations have never disappointed me), The Mitford series is a heartwarming collection of Christian fiction novels set in the fictional town of Mitford, North Carolina. 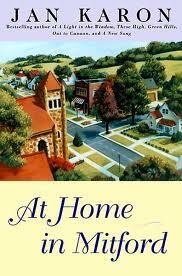 The books are slow-paced and the actions are mostly focused on the day-to-day activities of the characters, particularly Father Tim, an Episcopalian priest. Though I’ve never been to North Carolina and the culture of Portland, Oregon is a world away from traditional Southern hospitality, reading these books felt like coming home. I think what I most appreciated was watching the characters grow and change over time. It felt realistic, and it was comforting. This will be a series I come back to again and again. The Fault in Our Stars – John Green If you haven’t heard of this book or upcoming movie, you must be hiding under a rock. John Green’s young adult fiction novel made several lists for best books of 2012 (especially from Powell’s employees) and I used those recommendations to create my 2013 reading list. It took me a long time to finally sit down and read this book because I had heard it was an emotional rollercoaster. (I mean, teenage terminal cancer patients? Talk about a recipe for a heart wrenching story.) When I finally picked it up, I couldn’t put it down. I read the whole book in one sitting, and yes, I weeped at the end. I also read Green’s other YA novel this year: Looking for Alaska. 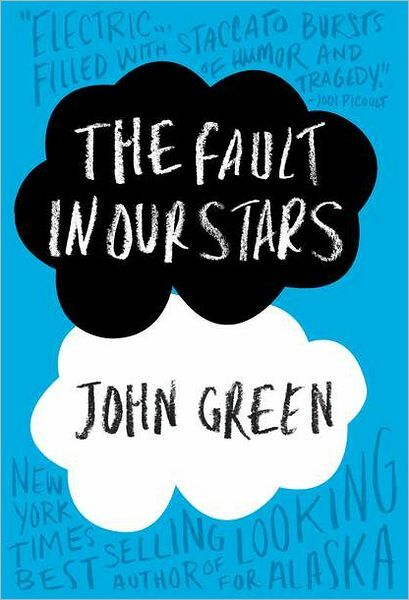 It’s not quite as good as The Fault in Our Stars but I still loved it. 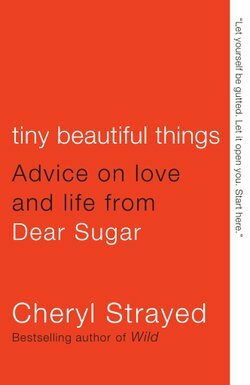 Nonfiction Tiny, Beautiful Things: Advice on Love and Life from Dear Sugar – Cheryl Strayed Tiny, Beautiful Things was easily my favorite nonfiction read of 2013. Strayed is more well known for her recent memoir Wild (see below). TBT predates Wild; it’s a collection of the letters she answered as an anonymous advice columnist “Dear Sugar.” I really enjoyed it, although it’s not your grandmother’s advice column. There’s a lot of language and adult content but there’s also so many excellent nuggets of wisdom. Sugar’s letters are beautiful and profound. She doesn’t merely advise people on their situations; she relates her own experiences and life lessons. Though I loved it, this advice probably isn’t everyone’s cup of tea (see aforementioned warning about language and adult content). But if you can move beyond the pieces you may disagree with, you are in for a treat. This book will make you think, it will make you laugh, and it will almost certainly make you cry. I plan to buy it as soon as I move home – this is book I want close at hand. 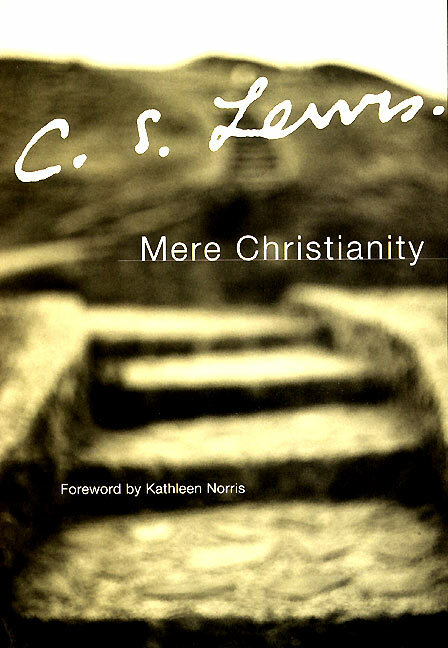 Mere Christianity – C.S. Lewis Lewis’s short book of Christian apologetics was originally a BBC radio broadcast during World War II. It’s style is conversational and it easily engages the reader, as it probably engaged listeners many years ago. Lewis did an excellent job in laying the foundation of Christian beliefs in easy-to-understand terms. While I didn’t agree with 100% of Lewis’s theology, I admired the way he explained difficult concepts and arguments. It’s clear why this book is a classic. 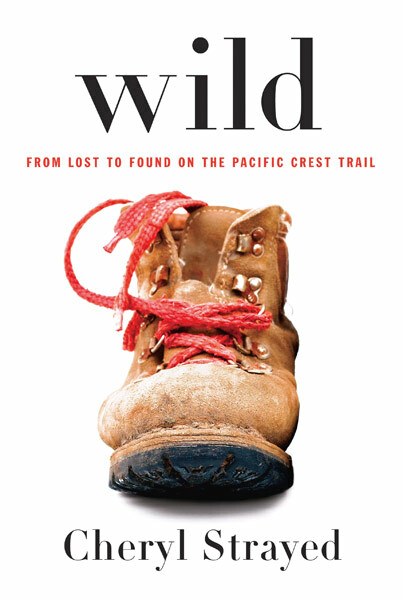 Wild – Cheryl Strayed Wild is another book that landed on a lot of best of 2012 lists. 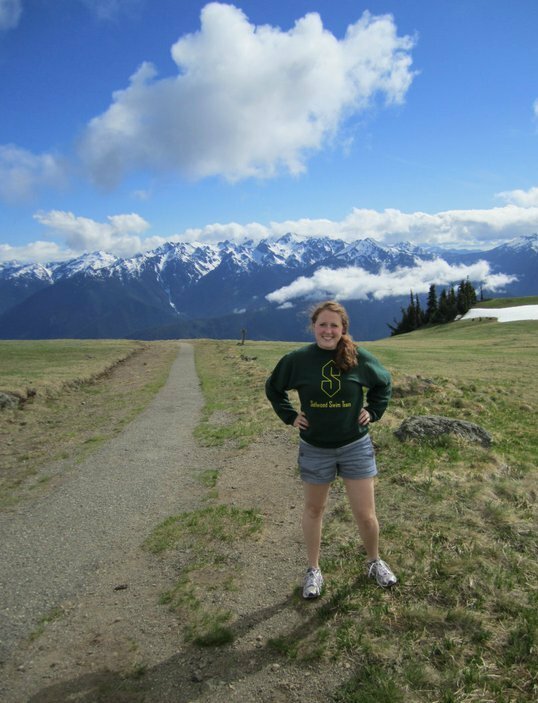 Strayed describes her experience hiking the Pacific Crest Trail as a young woman in her twenties who had recently lost her mother and gone through a divorce. Without much preparation, Strayed laced up her hiking boots and hit the trail. The people she meets and the lessons she learns change her perspective on life. It was an inspiring and well-written account set in a beautiful stretch of the Pacific Northwest. After reading this and another hiking tale, Becoming Odyssa, I’m ready to move home, buy some boots, and hit the trail myself! In case you’re curious about what I was re-reading, it was three series: Harry Potter, Ender’s Game and subsequent novels, and The Chronicles of Narnia. If you haven’t read any of these, I think they are all fantastic – obviously I liked them enough to drop my new reads and re-read them. That’s pretty much the highest praise I can give to a book. In case y’all are wondering about my 2014 goals…I decided not to set a number on how many books I read. Instead, I’m focusing on topics. I want to read more feminist literature, more about the food industry, and more history. And I’ll balance that out with a good dose of fiction, of course. 🙂 *Full disclosure, some of these were short stories (Sherlock Holmes mysteries) and young adult fiction which tends to be on the shorter side BUT I also read Les Misérables so I figure it all evens out in the end, right? Another semester is over and, just like that, it’s time for another Big Adventure. 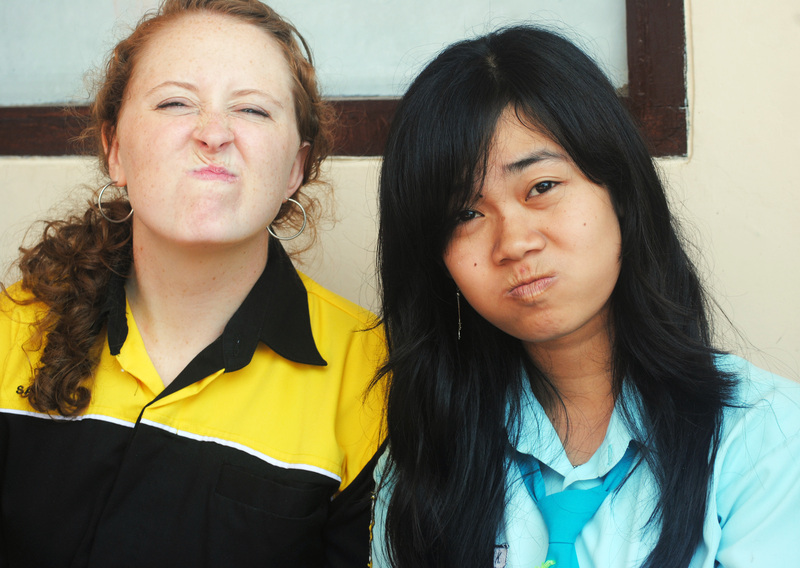 I and fellow PCV Britteney will be spending three weeks backpacking around Thailand, Cambodia, and Vietnam. I won’t be updating the blog for awhile because I won’t have my computer with me. So, enjoy the holidays and check back here in January! 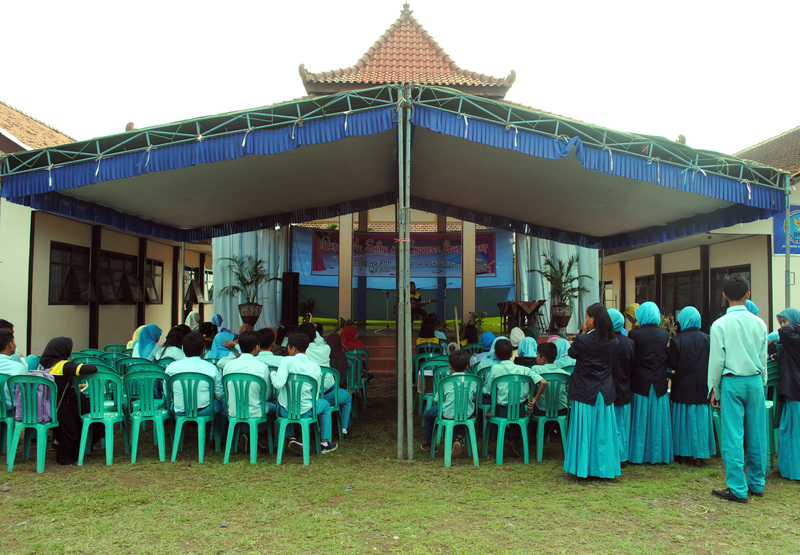 November is always a busy month at SMAN 1 Ngunut. November 20th marks our school’s anniversary (this year being the 29th) but the whole month is dedicated to preparing for and celebrating the occasion. Last year you may remember that I danced Gangnum Style with my students (I still consider this my crowning achievement in Peace Corps) and helped directed the English Club drama. Last year our celebrations last eight days but this year we officially scaled back to only four. In reality, though, we still took a solid week for activities because the first few days included a girls’ volleyball tournament with 9 senior high schools in the area as well as the English spelling bee contest. Naturally all the classes were informally canceled because of these events. 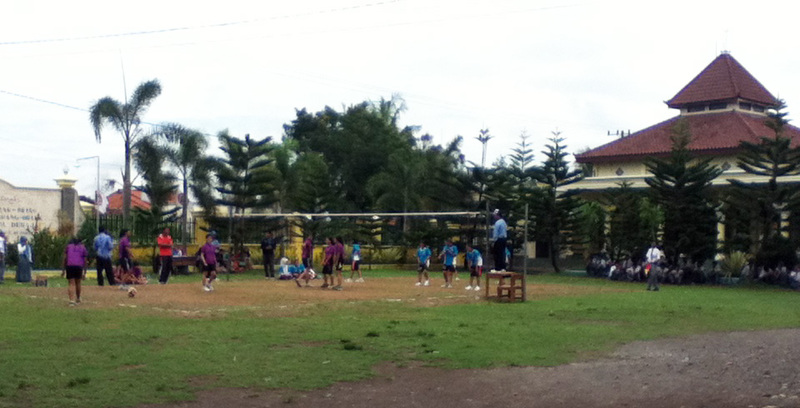 Volleyball in front of our school. Our girls are in yellow. They were very impressive! 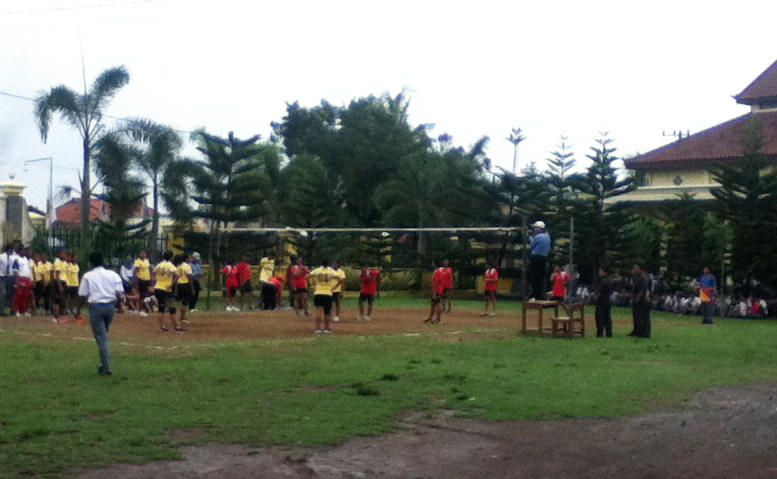 I was very excited to see that my school hosted a GIRLS sports event. I was also excited to see the girls in sports gear similar to what I would see in the States. More than anything this is just an emotional reaction. Though I’ve never blogged about it, I’ve talked with some my students about wearing a jilbab (veil) and their clothing choices. The ones I talked with were quite articulate about their reasons for/for not wearing these clothes. There’s not as much social pressure at my school for girls to be veiled compared to what I’ve heard about at other schools. (In fact, I’m currently very puzzled by several of my students who only wear a veil a few days of the week or just every now and then. But I’ll save that for another post another time.) For these reasons I respect the girls who make their own decisions about the clothes they wear. I also respect the fact that the volleyball girls got to wear spandex shorts! I love watching sports and I especially love seeing my students shine in areas outside the classroom so it was a blast to watch the tournament. I even convinced my counterpart to cancel class for it – something I have never advocated before…there’s a first time for everything. Our girls did well – they got 2nd place! The English spelling bee was definitely a success. It was even better than the first spelling bee we had last May. 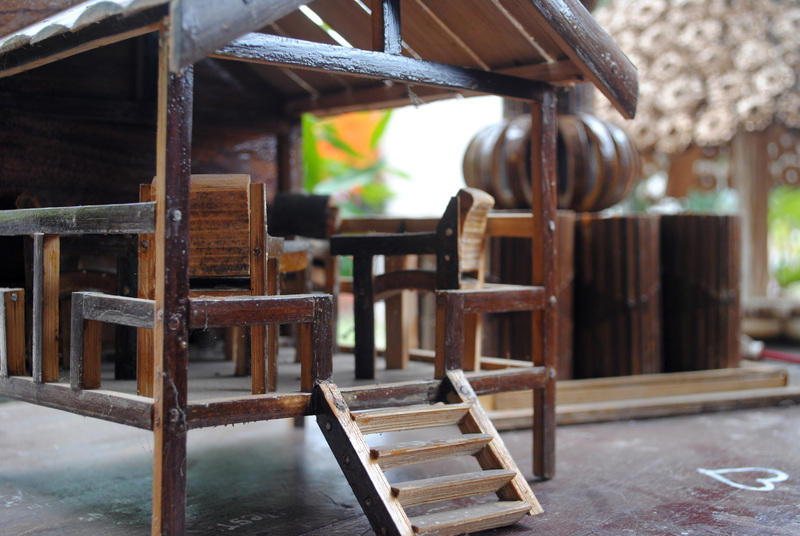 I already blogged about Agus, who won first place. 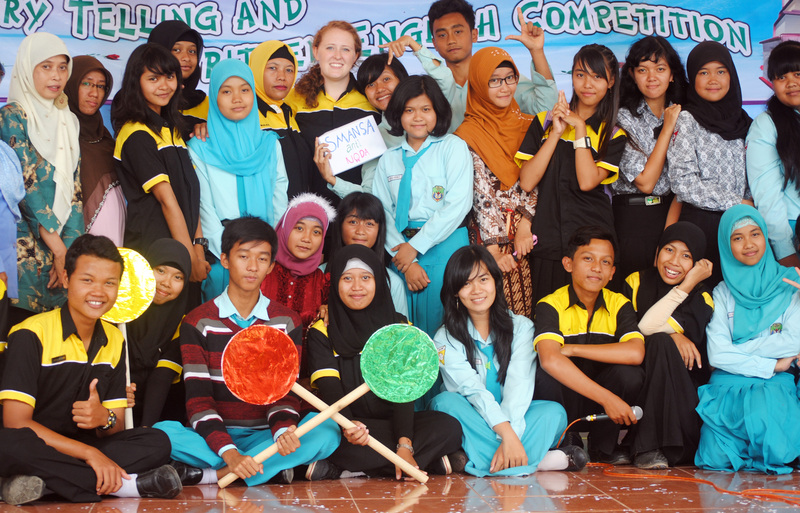 Other highlights for me were seeing so many of my English club students last into the final rounds. It was also fun to see them cheering on their friends. And one of my tenth graders stuck through almost to the end. 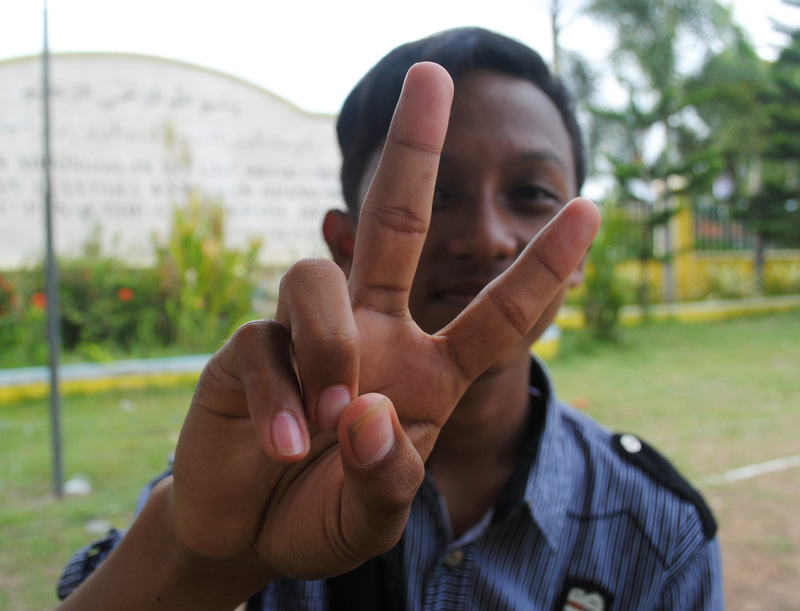 He was the last tenth grader (and therefore youngest student) for several rounds. 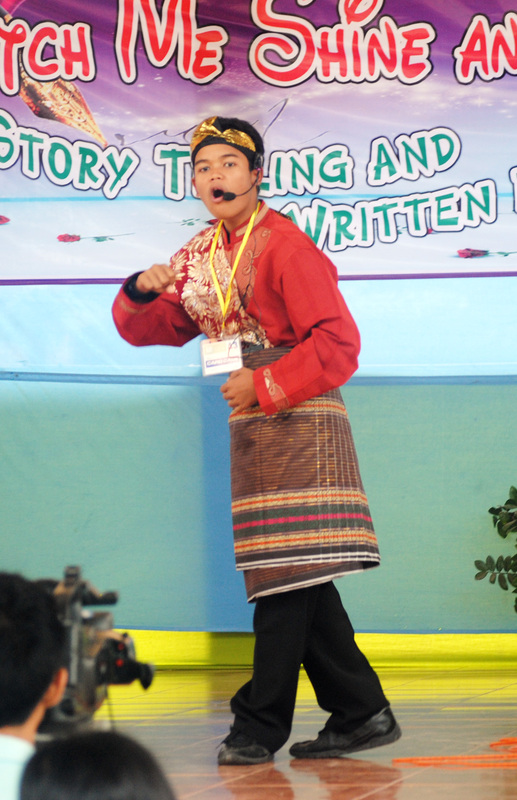 One of the junior high school students telling his story. 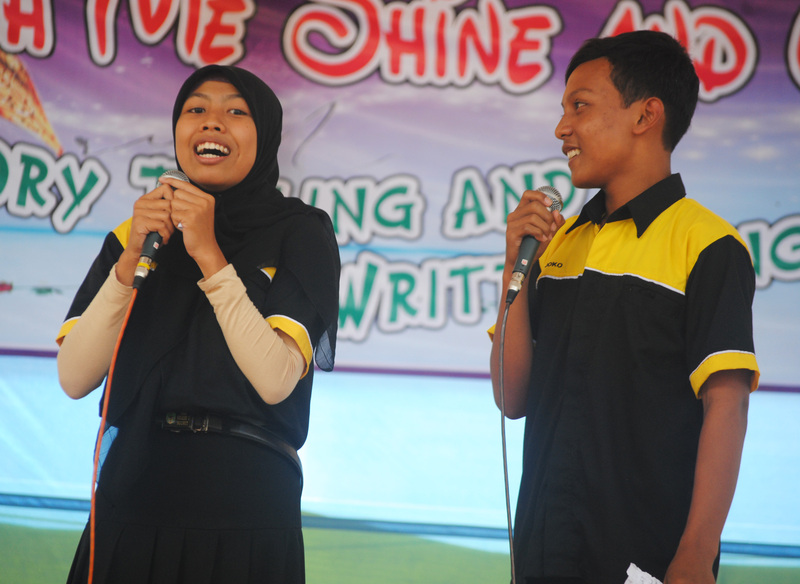 Our lovely emcees, Defi and Joko, who impressed me with their courage to host an event using English! On Friday morning students and teachers alike were at school bright and early for the “healthy bike ride” (the translation just doesn’t do it justice). I was very excited about this as we had a sepeda sehat back in September but it was just after my stint in the hospital and I was too weak to join. 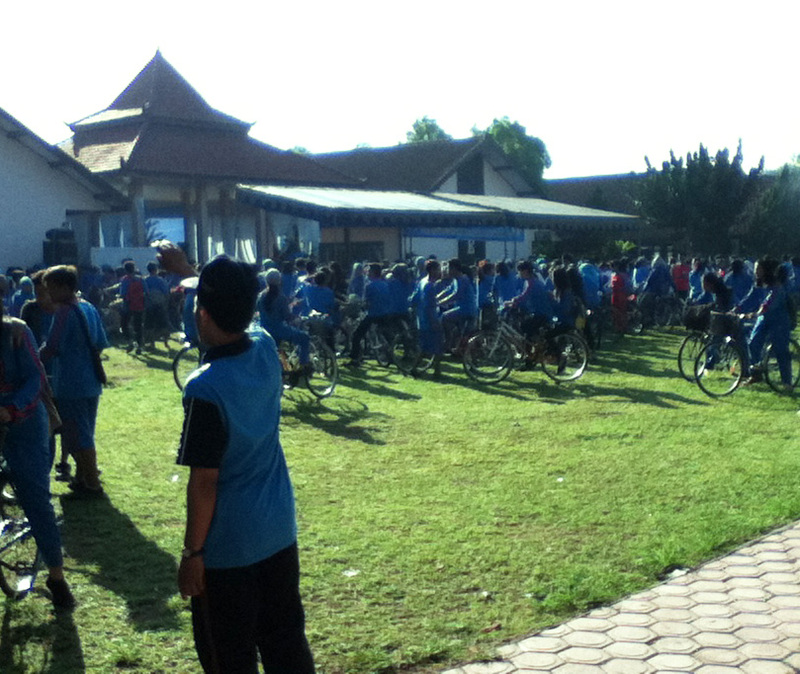 I rolled into school at 6 AM to see that the place was packed full of bicycles. To my amazement there was one other teacher who wore a bike helmet! I was sure I would be alone. After a flurry of text messages I managed to meet up with my 12th grade students. Thanks to some miscommunications and a broken bicycle we were at the back of the pack – but it was much more fun to ride without a crowd. It was still early so it wasn’t too hot and it was a gorgeous day. We pedaled past kilometers of rice fields set against a landscape of hills. We stopped for photoshoots (of course) and to switch who was riding what bicycle (since a couple had bikers with passangers on the back). Most bikes come with racks here so you can easily give your friend a lift. I had tried that in the past and it was a failure. I’m not known for an excellent sense of balance and – to my credit – I haven’t been practicing since birth like most Indonesians. But on that day, we tried again. Agus rode my bicycle and I sat on the back. I discovered that I could include balance and once I got the hang of it, it was awesome. No work for me! 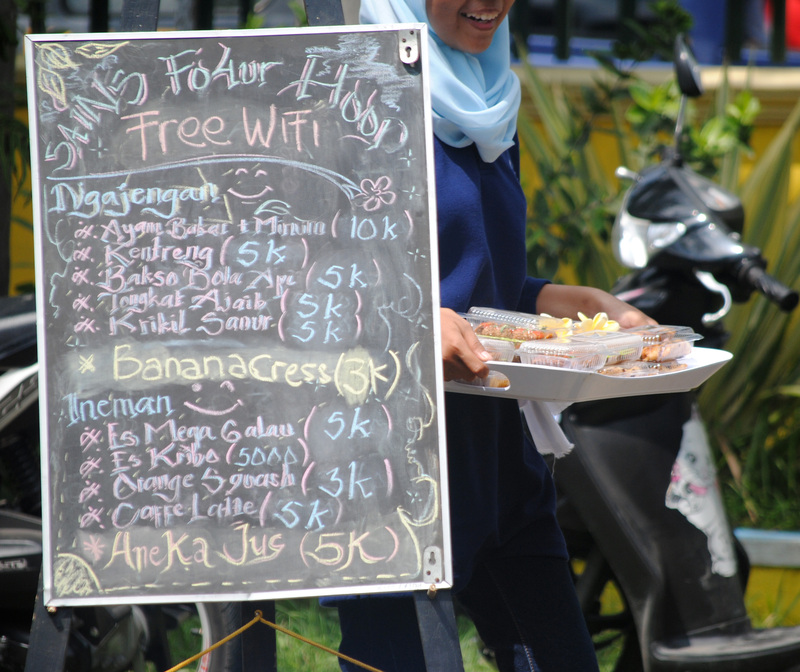 Free wifi?!?! I actually asked about this claim and they just laughed. Apparently it’s no problem lying in an attempt to draw in customers! Every 11th grade class had a stand assigned to them. They were free to decorate it however they wished and then they created menus of food and drink to sell to attendees. 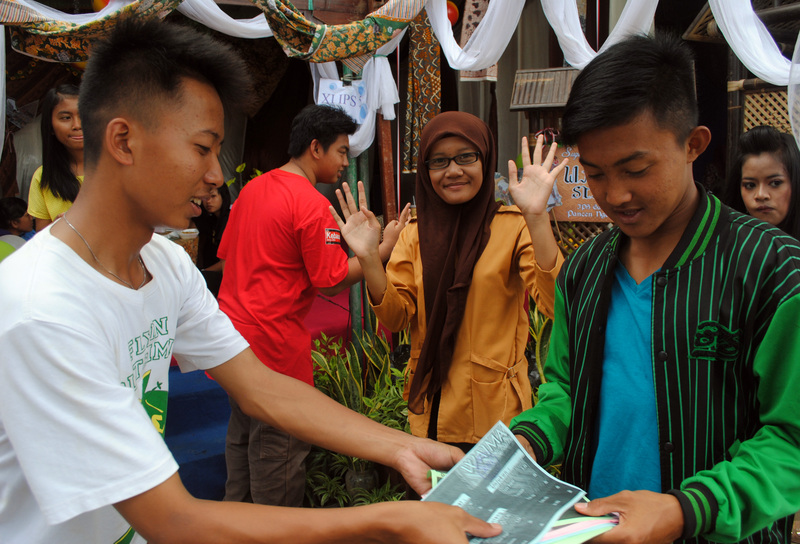 The students would active about promoting their products – they would bring printed menus to the teachers’ room and deliver food and walk around with samples to show everyone what they had to offer. Every class asked me at least once to buy their food. I’m bad at saying “no” so I usually said “later” but that got me in trouble when they would hunt me down a couple hours later: “Miss, you promised to buy ice cream!” Needless to say, I didn’t go hungry that Saturday and Sunday. I really only wanted to visit the stand of the one 11th grade class I teach – and they did not disappoint. One of my favorite parts of Dies Natalis this year was that it included a showcase of student artwork. It brought back many memories of my high school art classes (all four years!) and the annual art show every spring. 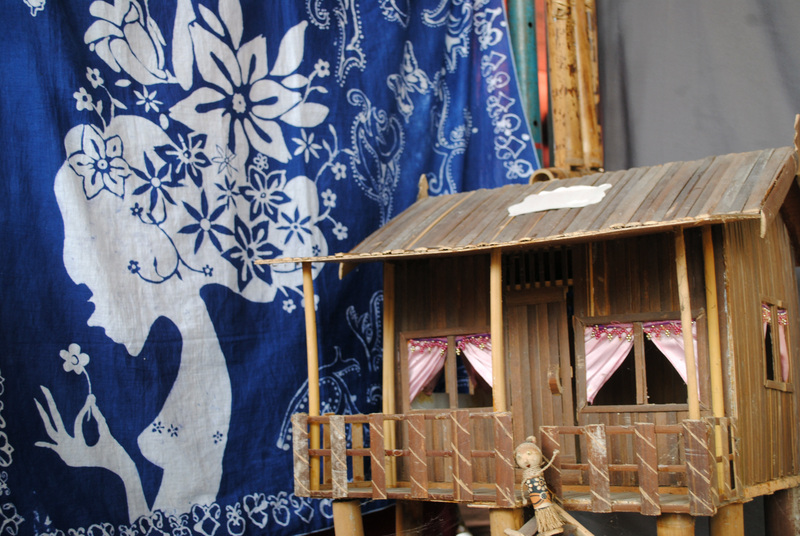 There was a myriad of art mediums – everything from canvas paintings to batik fabric to miniature buildings. 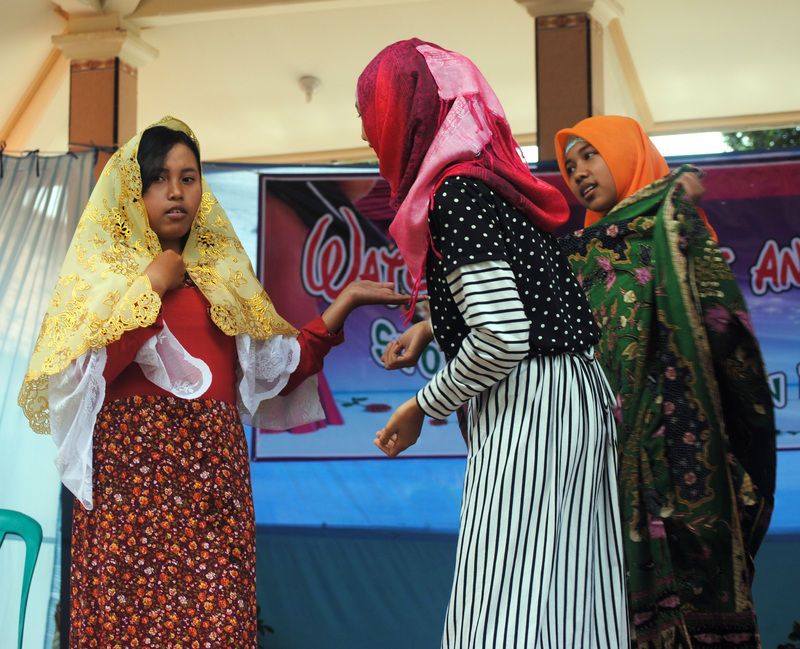 On Saturday all the tenth and eleventh grade classes performed some kind of talent (skit, singing, reading a poem, dancing, etc) in a school-wide class talent show competition. My favorite performance (of the few I watched) was my 11th grade class that put on a talent show. I have one student, Faisal, who lives for the stage. He’s sweet in class but he’s fierce on stage. I’ll let the pictures speak for themselves. They finished by singing Happy Birthday (HUT = Hari Ulang Tahun = Birthday) to our school. The cell phone company/ event sponsor giving out free pulsa (phone credit) to students. 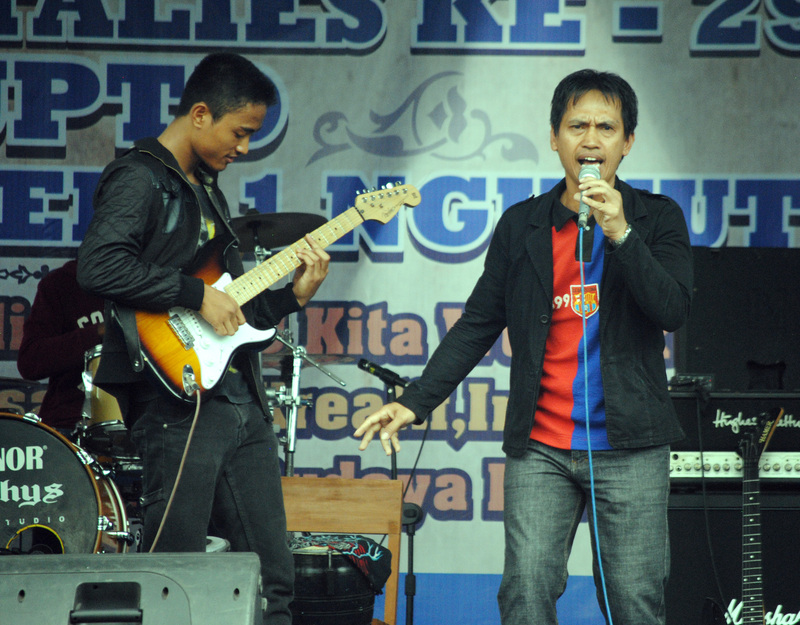 One of my former students rocking out on the electric guitar while Pak Tomy, our school’s famous radio host, emcee extraordinaire, and PE teacher, sang. Side note: Pak Tomy has literally emceed every event I’ve gone to in this area. 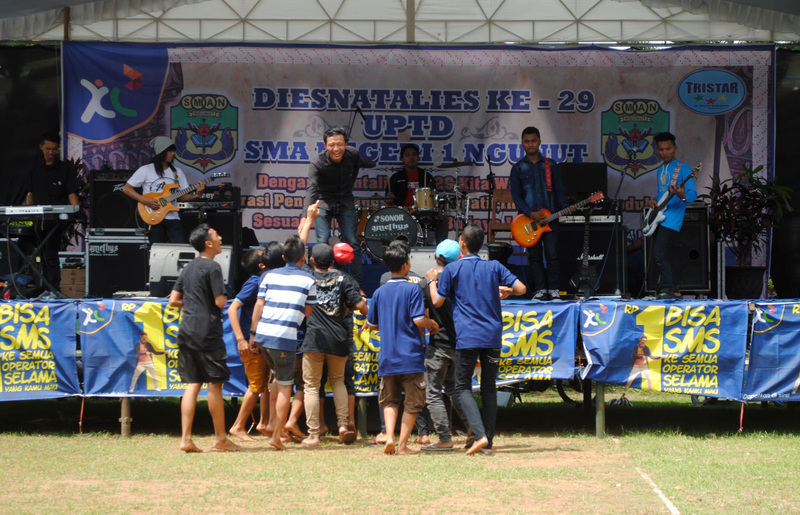 Sunday was the final day of Dies Natalis and it was the second day of Pensi, with a different focus. 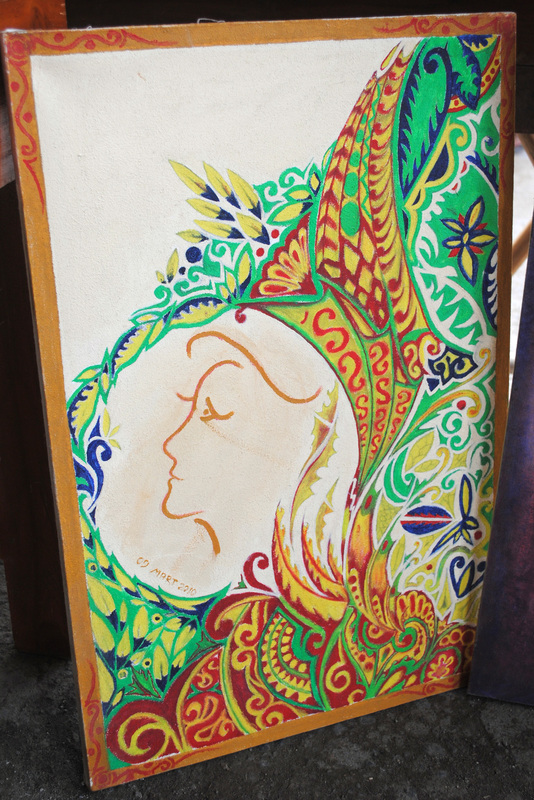 Pensi is short for Pentas Seni which translates literally to “stage art” but is better described as “talent show.” While Saturday featured 10th and 11th grade classes, Sunday was open for student bands and guest performers. We couldn’t top last year when the school invited a reggae band and absolutely packed out the place. This year was more low-key but still lots of fun, in my humble opinion. I spent the day with Agus and Joko, checking out the music, the art, and eating at the food stand. 1. I am thankful for the children that greet me on my way home from school every day. If I’ve had a bad day and I’m feeling frustrated or overwhelmed, these kids always lift my spirits. It’s hard to stay angry when a gaggle of adorable elementary school children gleefully yell, “MISS SARAH!” as I ride by. I’m also grateful for the old man who sits on his porch next to the little mosque on my street. Every day we nod and monggo at each other. Even though I don’t know his name and we’ve never actually talked I’m grateful for this routine and daily reminder that I’m in a community where people sit on their porches and greet passersby. 2. I am grateful for my students, especially those mentioned in the previous post, and I’m especially grateful that they’ve opened up to me. It’s not all serious stuff either. They can be sassy and they don’t mind making fun of me. We can share a sense of humor and have inside jokes. They’re a hoot. 3. I am extremely grateful for my host family. I really think I was placed with the perfect host family (for me). I honestly can’t think of anything I would want to change about this situation. One thing I really appreciate about my host family is how supportive they are of each other (and me) even if they/I don’t follow the traditional path. For example, a common line of questioning here is, “Are you married? Will you get married when you go home? What is your plan for getting married? You don’t have a boyfriend? Really?” My host family never asks questions like that. They have, in recent months, asked me once or twice about the whole “do I want to get married” thing. But on many more occasions they have said I should go to graduate school and work and think about those things before marriage. What Indonesian family says things like that?! They also told me I shouldn’t worry about not having a boyfriend because any guy in America would be lucky to marry me and there’s plenty of time for that later. And it’s not only me – I have several unmarried host siblings/other relatives in their late 20s and 30s (male and female!) and I have never heard anyone in my host family pressure them to get married or even talk about it all. To be honest I’m really curious about what the situation is but I think it’s AWESOME that my host family acts atypically from the average Indonesian family. That’s just one reason that they are wonderful and while I could continue on for a few thousand more words, I will leave it at that. 4. I’m SO grateful for my counterparts. I seriously lucked out in the counterpart department. I’ve had my ups and downs working with CPs but every single one of my counterparts (especially in my second year) is motivated and hard-working. They are always game to try new things and they have great ideas, too. For some volunteers, counterparts can be obstacles. Maybe they don’t want to try something different or they won’t lesson plan with the volunteer or they frequently skip class*. My CPs don’t do these things and so we’re able to work together and support each other. We’re truly stronger together. One of my CPs said that she no longer likes teaching alone because it’s better when there are two teachers. I was touched by that but I don’t think it’s due to my influence – I think it’s a testimony to how great these English teachers are. 5. I’m grateful for my school community. My school is really big. There’s more than a thousand students and about one hundred teachers and staff. That’s larger than the high school I attended! You would think that it would be easy to be lost in the crowd but I really think that SMAN 1 Ngunut lives up to its claim of being a keluarga besar (big family). The teachers aren’t just colleagues; they’re also friends. If someone is sick or a family member passes away the teachers will pile into cars to go visit. If a teacher/family member of one of the teachers gets married that teacher frequently invites the entire staff to the wedding. 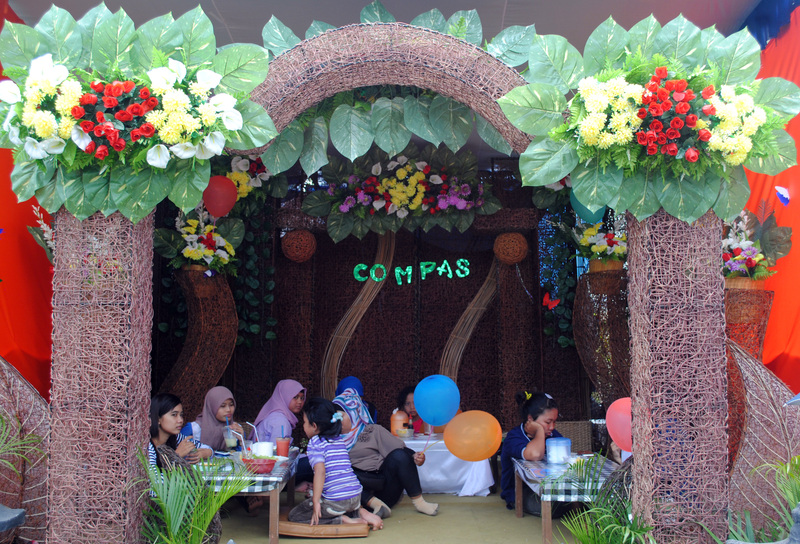 During Ramadan the teachers frequently break fast together. 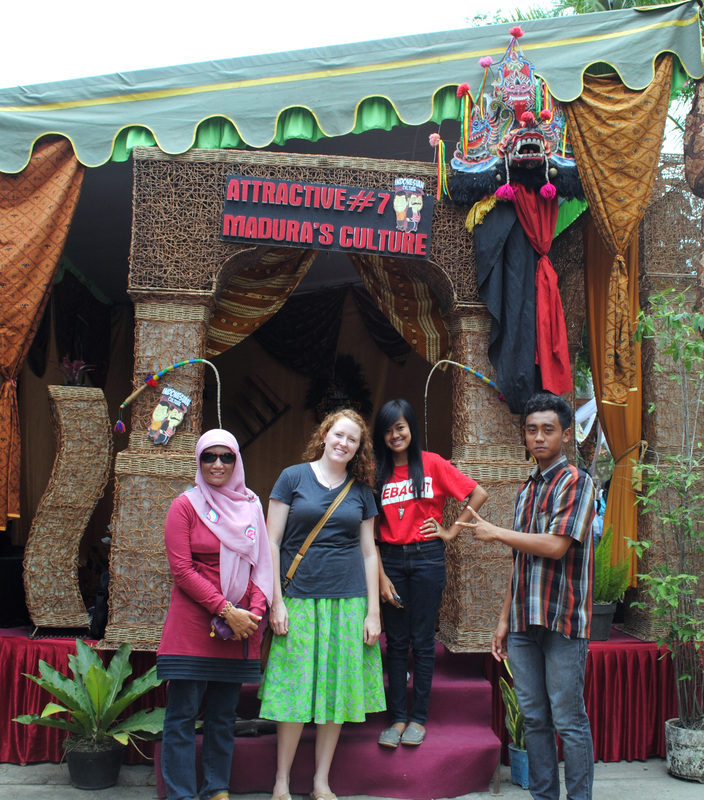 We also do different activities like playing gamelan or acting ketoprak (Javanese drama) throughout the year. On a personal level, almost all the teachers talk with me in the teachers’ room. I feel quite comfortable hanging out with all the non-English teachers. It probably helps that I’ve gone on trips (student trip to Bali) and done activities (ketoprak) in which no other English teachers join. So it’s normal now for those other teachers to talk and joke with me even though we don’t lesson plan or teach together. 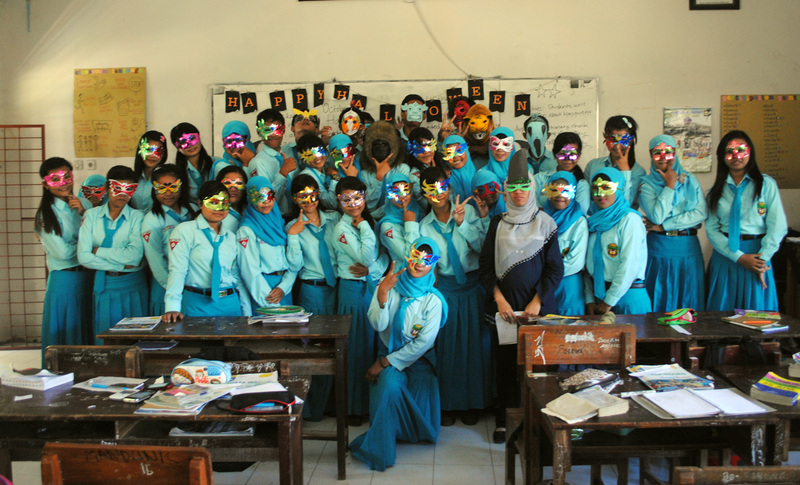 I love this big family at SMAN 1 Ngunut. I wouldn’t feel that this post was complete without mentioning how thankful I am for my family and friends back home. I may be far, far away but the support of my family and friends sustains me and makes me a better volunteer here. I am loving my Peace Corps experience but that doesn’t change the fact that I am SO excited to be home next year with my loved ones. Six more months! *It helps that my school is huge and we have 6 English teachers. There are a couple teachers who will not be named who frequently skip class and don’t lesson plan and are not motivated or hard-working. Luckily I don’t have to work with these teachers because there’s a wide enough pool to choose from. 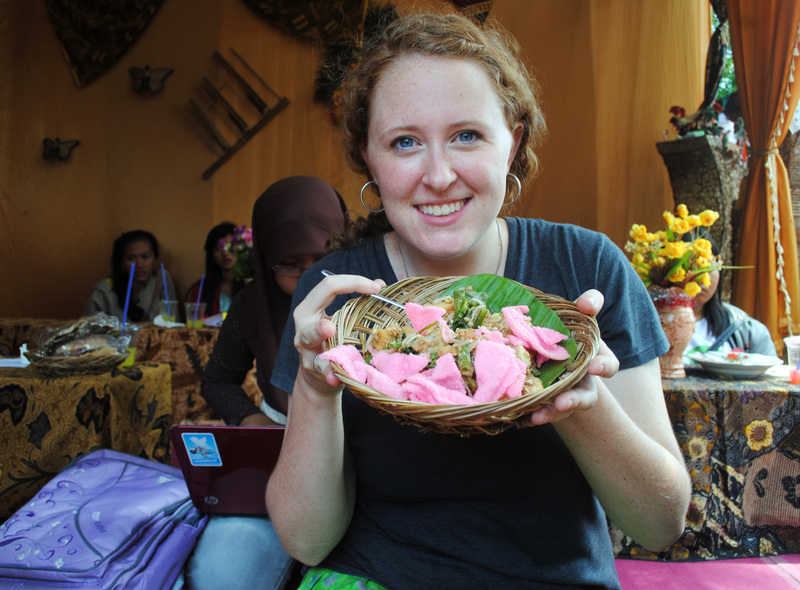 Most PCVs don’t have this luxury because their schools are smaller than mine. Hands down, my favorite activity every week is my informal speaking class with my (now) 12th grade students. I’ve mentioned this speaking les (les means “extra lessons”) in previous posts but it’s been awhile. We started meeting last February after one of my students, Deva, sent me a text that said, “Miss, will you help me?” I replied, “Sure, with what?” Her response: “I want to become fluent in February. Will you help me to practice speaking?” Not to discourage her from an unattainable goal, I quickly said, “Yes! And let’s invite your friends too.” So we started meeting each week and discussing a new topic or question. Over the months some students have come and gone but I have a solid group of four students who have become my favorite students and friends here. My relationships with them give meaning and purpose to my service here (plus, they’re a lot of fun) so I thought it was high time that I introduce them to you. As I mentioned before, speaking les was Deva’s idea. She’s eager to learn more English and she’s not shy to ask me for help. 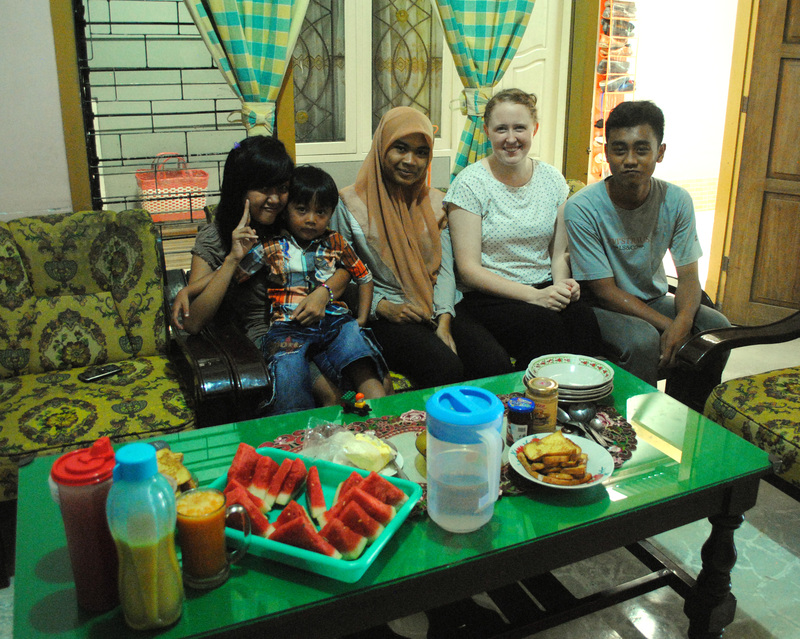 In fact, Deva was the first student to ever visit me at my house. I remember it was last year during Ramadan and I was nervous! I wondered what we would talk about or do. Should I speak in bahasa Indonesia or did she want to practice English? I needn’t have worried, we played hangman, rode bikes around our village (Deva lives in my same village so I consider her my neighbor, though she lives on the other side of the main road), and I broke fast with her family at her house that evening. Ever since then we’ve been friends. 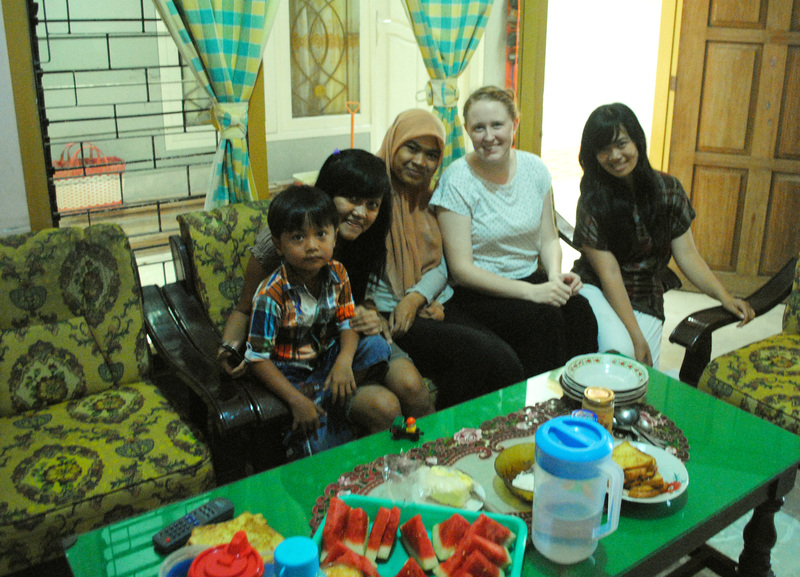 Last March I went to Jogja for a few days with Bu Wiwik, one of the English teachers, and Deva asked if she could join. Since Bu Wiwik mostly wanted to spend time with her first grandchild (only a few months old!) Deva and I were free to explore the city. She hadn’t been to a big city before and it was a lot of fun to watch her discover things. I think of all of these students as adik-adik (younger siblings) more than students, but Deva most of all. We have great conversations about love and life and the problems here and potential solutions and how we can help others. Deva often helps me lead my Friday les for elementary school children and she’s good at it. She says she wants to be a volunteer or a teacher when she’s older. One of my favorite memories of Deva and Agus (see below) is from this past August. I woke up sick one morning with a run-of-the-mill stomach bug. I don’t get sick often here but when it happens I pretty much know what to do. I rested and tried to drink oral rehydration salts but I couldn’t keep anything down. I had a fever and it was getting higher and higher and I was in so much pain from dehydration. After about 17 hours of this the doctor told me I needed to go to the hospital because I was severely dehydrated and since my body was ejecting all liquids I needed to get an IV. I had never been hospitalized in my life and I’ve been rather terrified of all things medical since I was a child…but I was so sick I almost didn’t care. I ended up staying in the hospital for two nights. The morning after I was hospitalized, Agus and Deva showed up to my hospital room. It was a holiday that day and they spent the entire day with me, just sitting there (and telling me I should eat and rest). They’ve now seen me at my worst (I didn’t get to mandi for 2 days and I hadn’t washed my hair in a week! I felt absolutely disgusting and that was only amplified by the fact that I had 30 visitors over those two days and there wasn’t much to do besides look at me) and that definitely creates a bond. For my first hospitalization, I’m so grateful that two of my favorite students were willing to give up a whole day to spend with me. It made it bearable and I felt loved. Agus is my neighbor and I think he’s also related to my family somehow. My ibu (now a retired elementary school teacher) taught him in elementary school and last year he was my student. This year he’s in 12th grade so I only see him for speaking les. 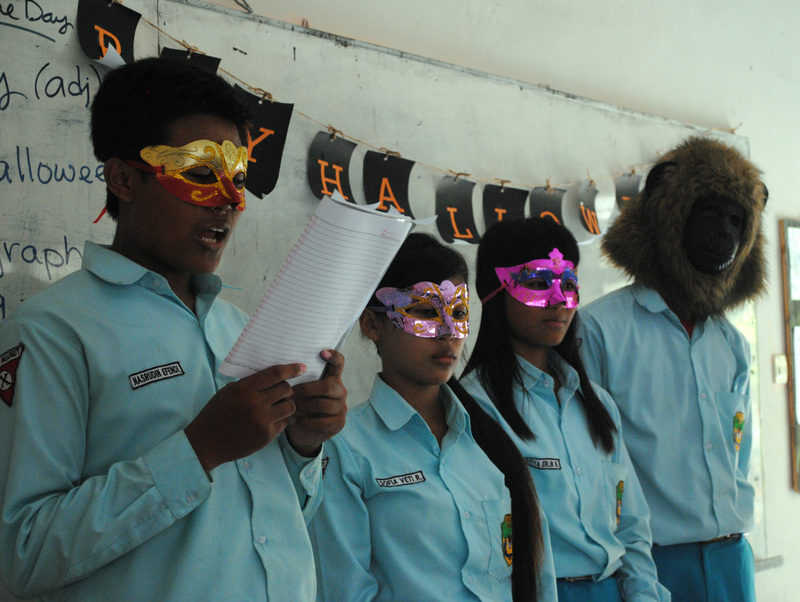 Last year I recruited Agus to join English Club because we were performing a drama and Bu Chris and I were looking for a male student to be the big, green monster. Surprisingly, no one wanted the job and finally we asked Agus because he was in our class and we knew he had pretty good English. To my surprise, he said yes and jumped right in. Before the drama he didn’t know the other students who are featured in this post but now they are all close friends (and I take a little bit of credit for that). I have seen a huge improvement in Agus over the past year, especially in his self-confidence. Despite consistently being the male student with the highest grade in his class, he has always thought and said that he wasn’t very smart. I disagree and so does my ibu, who said he was at the top of his class in elementary school. When we first started speaking les, Agus was always pretty quiet. 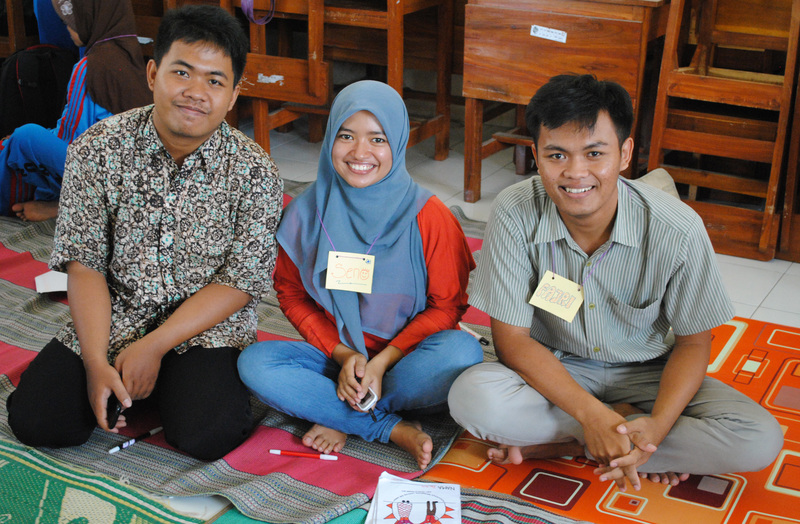 He was the last to answer the question for the day and he tended to want to speak in bahasa Indonesia. But over the months he has improved dramatically. Now he is quick to speak English and he speaks it well. Now he will volunteer to be the first to share and he will help to correct his friends’ mistakes in English. His shining moment came this two weeks ago during our school’s anniversary when we had a spelling bee competition for students from 10th, 11th, and 12th grades. 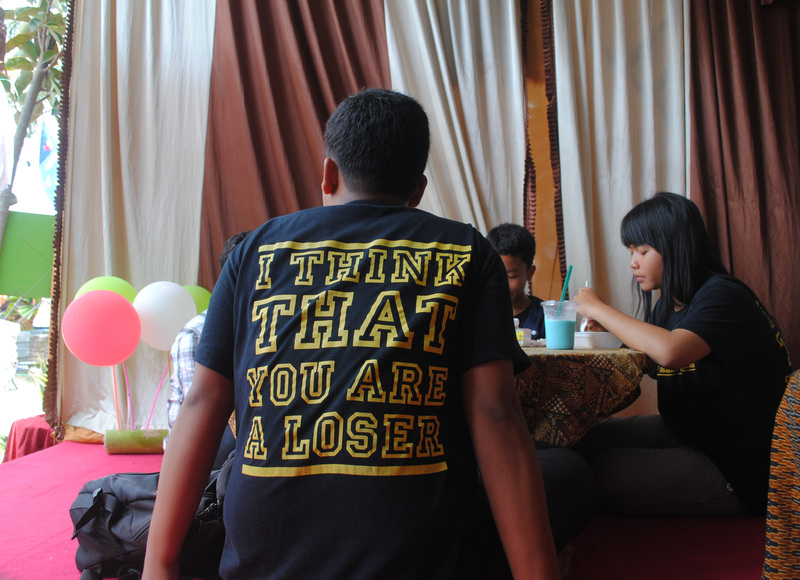 Agus is not naturally the best speller; in fact, when we had our first spelling bee last year, he didn’t even join. 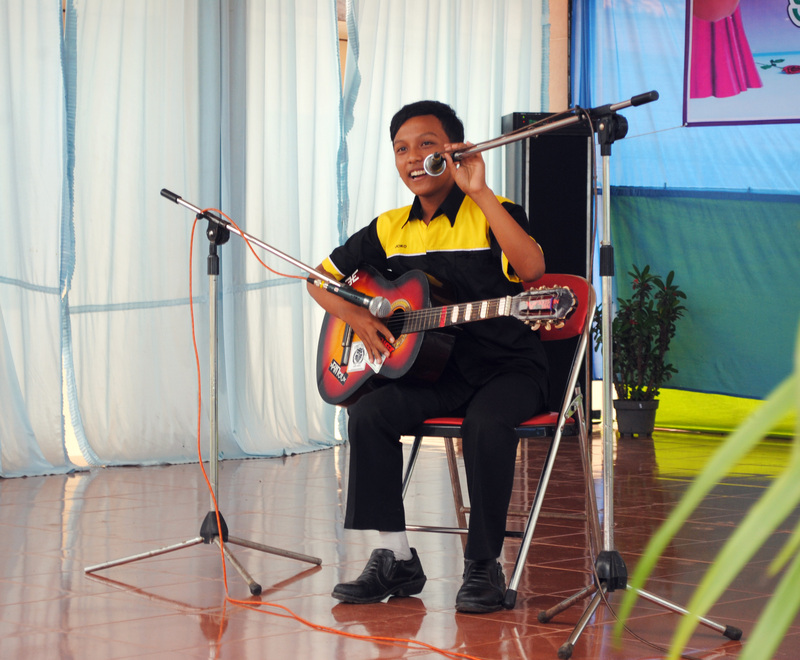 When we practiced together, he often made mistakes by pronouncing the letters like you would in bahasa Indonesia. 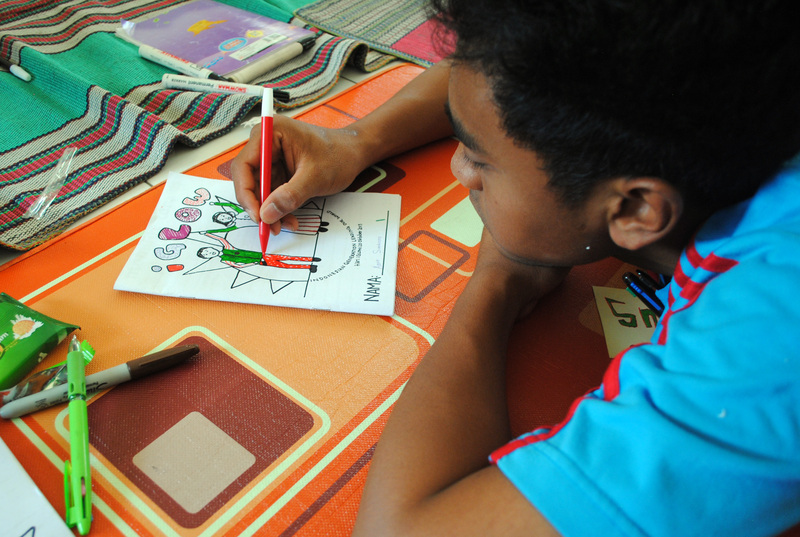 Other students could quickly memorize the words but Agus had to work at it. He came over to my house to practice for two days before the spelling bee. Both times he had trouble remembering the spelling and saying the letters with an English pronunciation. I was pretty sure he would be eliminated quickly but to my amazement he made it through 13 rounds, which included 3 rounds of new words that weren’t on the list he was given….and he won first place! He beat 57 other students and I was SO PROUD. Other fun facts about Agus: he loves to eat. The rest of us always tease him because if I have snacks during les he might very well eat them all. He’s also a big fan of cooking together and is always ready to try new foods. He also loves Justin Bieber more than most teenage girls I know and he has JB’s biography practically memorized. One time in speaking les I asked Agus to describe what he wants to do with his future. He answered that he wants to play professional football [soccer] (since he’s too short to play professional basketball) and be a farmer and go to university and study languages and have a business and so on. He has lots of dreams and isn’t committed to any one career (I can relate). But now that he’s a 12th grader he has to actually pick something to do for next year and it’s my personal goal to help him search for scholarships because that’s the only way college will be an option for him. Fingers crossed! Yola was English Club President last year but now she is happily the “ex-president” as she calls it since she’s busy studying for the national exam as a 12th grader. Yola is smart and good at English and an excellent speller (my money was on her for the spelling bee but I stumped her with the word “audible” – it was an extra word that wasn’t on the original list). Yola is a great leader not because she’s the loudest personality or has the best English but instead she is approachable, responsible, and consistent. Because she is a quieter presence, I don’t have the same kind of stories about Yola that I have for some of the others but that doesn’t mean she hasn’t been an essential part of the activities I’ve done here. I know I can count on Yola; she’ll join my activities, she’ll follow through, and she’ll let me know if she can’t come when she’s previously made a commitment. Those can be rare qualities in a place where flexibility and rubber time create an informal (and sometimes unproductive) atmosphere. 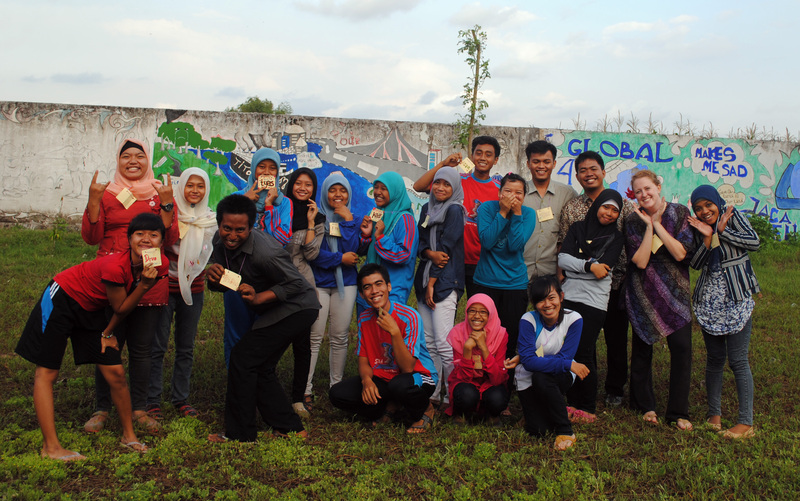 Some of my favorite memories of Yola are from when I watched her lead English Club activities. We’ve always had trouble with attendance and Yola came up with creative solutions or “punishments” for members who usually skipped out on the meetings. Earlier this semester the English Club leaders showed the film Akeelah and the Bee, which we had watched together the previous year. She assigned the 11th graders to pause the movie and explain the events for the new 10th graders. That delegation forced those 11th graders to be present, active, and responsible. (That’s my style of leadership!) I also loved the day when she brought a worksheet for English Club to study and it was “texting lingo” from some textbook somewhere under a chapter entitled “Teenager Activities.” The worksheet was full of sentences like, “lol brb I g2g eat can I ttyl?” that students had to decode. I haven’t seen that level of abbreviated madness since my AOL Instant Messaging days (8th grade, anyone?). Naturally, the students loved it. Joko is small but he has the biggest heart. He’s full of energy and motivation and he has always a positive attitude. Seriously, this kid is the best. The first time I met Joko was during my first English Club meeting (English Club was in existence long before I arrived). 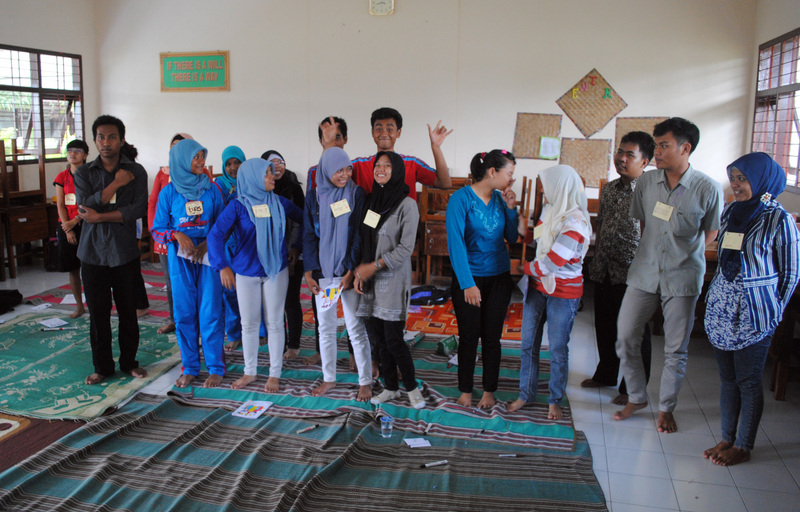 We played a game and I don’t remember much except that students who lost got a punishment of having to sing or dance. 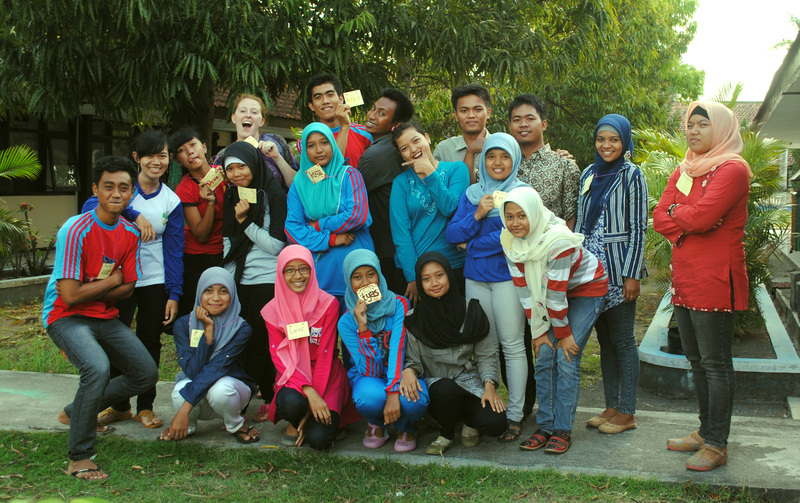 Most students were so shy but Joko was not even fazed. He put in one earbud to listen to whatever pop song was playing on his cell phone and he started belting it out. This kid can sing! 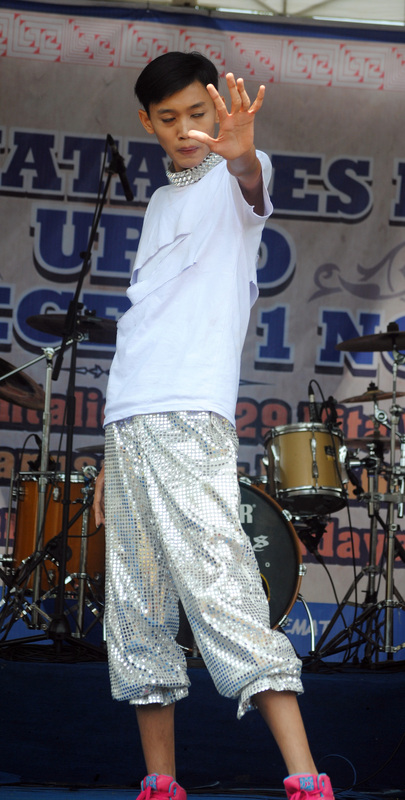 Last October Joko joined an English singing competition at a nearby university. 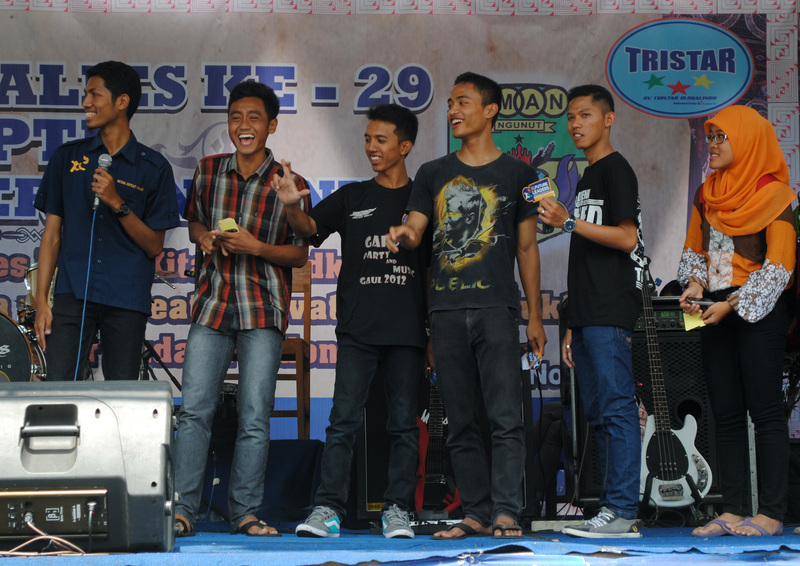 The participants had to choose a song off a list of several options and then they had to translate an Indonesian song into English and perform that as well. I had my doubts about how this would work out but Joko worked out to translate the lyrics by himself and then I helped him with some corrections. The Indonesian song is entitled “Butiran Debu” which literally translates to “Dust Particle.” We agreed that sounded ridiculous and changed it to “Only Dust” (the refrain being, “Without you, I am only dust”….definitely an improvement over “without you, I am dust particle”). To my amazement it turned out SO well. I think the English version is better than the Indonesian! And it’s that much more special because Joko translated it himself and put his spin on it. Joko worked so, so hard. He came over to my house almost every day to practice his singing and check his grammar and pronunciation. 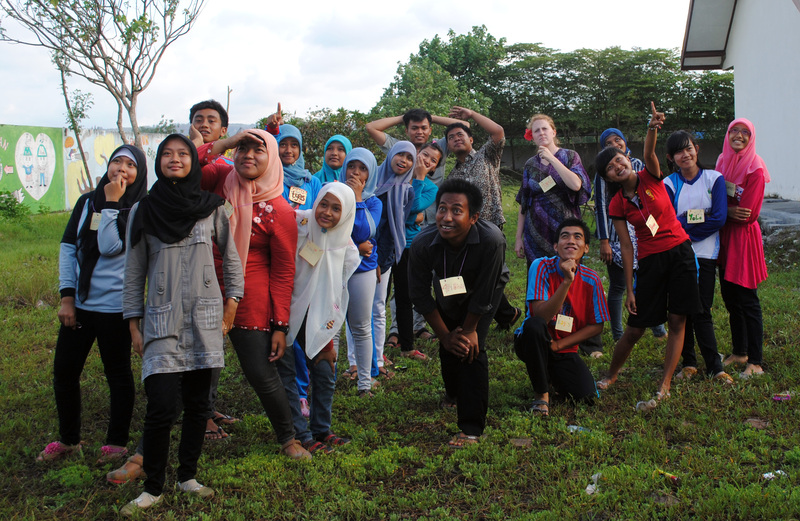 There were several other students joining different competitions at the university (speech, writing, story-telling, and so on) and Joko brought them all over to practice with me. 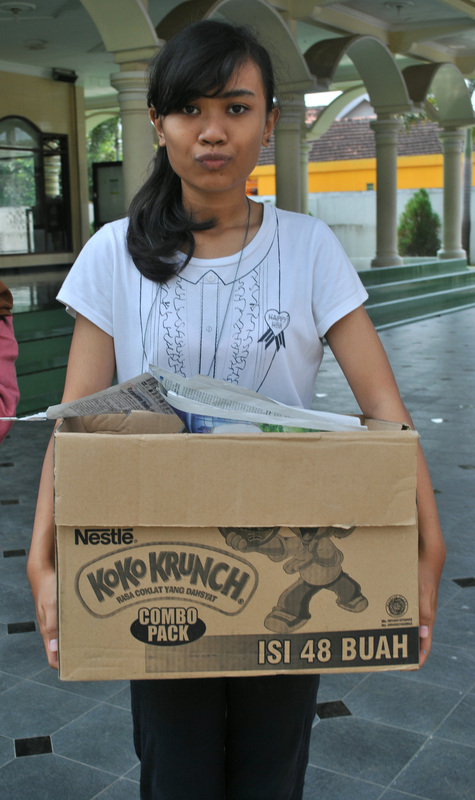 The others were shy or quiet or unprepared but Joko was always ready to help and motivate them. There was no doubt in my mind that Joko deserved to win that competition and I truly couldn’t imagine an Indonesian high school student performing with better English. I was heartbroken to hear that he didn’t place in the top 3. He was pretty sad too because he believed he could do it. (We speculated that the judges chose the best vocalists rather than focusing on who had the best English OR who translated the lyrics without just using Google Translate….) But just last week he heard from someone at the school and they told him he got 4th place! He may not have won anything but he was still one of the best and 4th out of 25 ain’t bad. 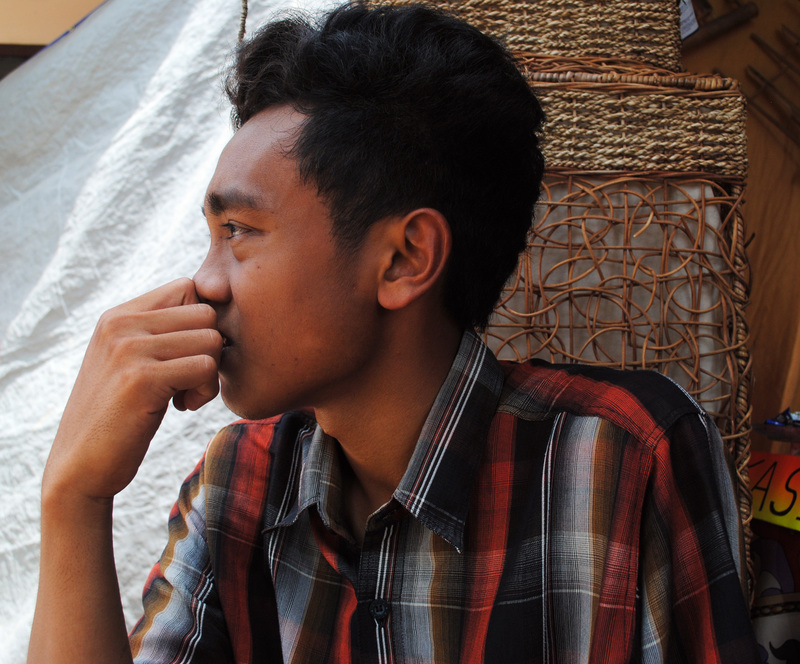 Joko wants to be a volunteer and teach in a rural area because he’s identified poor education in rural parts of Indonesia (think Papua, parts of Kalimantan, etc) as a big issue. Last week we discussed problems Indonesia is facing and my students all agreed that better education would work to decrease poverty, corruption, and a host of other issues. As an educator, I was thrilled to hear that and even more excited to see that they are motivated by wanting to “be the change they want to see,” in Gandhi’s words. Awanda is a new addition to our speaking les group. She was my student last year, from the same class as Agus. She’s an excellent writer. In that class I gave all the students journals and Awanda wrote a short story for me (in English!) that still hasn’t been concluded. Last year in class Wanda was pretty quiet and I just got to know her through her writings. I was surprised when she applied to join iGLOW Camp last year. I didn’t expect to be impressed by her interview because we were looking for strong, self-confident female students who wanted to be leaders…but honestly, Wanda’s interview blew me away. She was articulate and passionate. She made it into the Elite Eight who got to join the camp. Through iGLOW I saw a whole different side to Wanda. 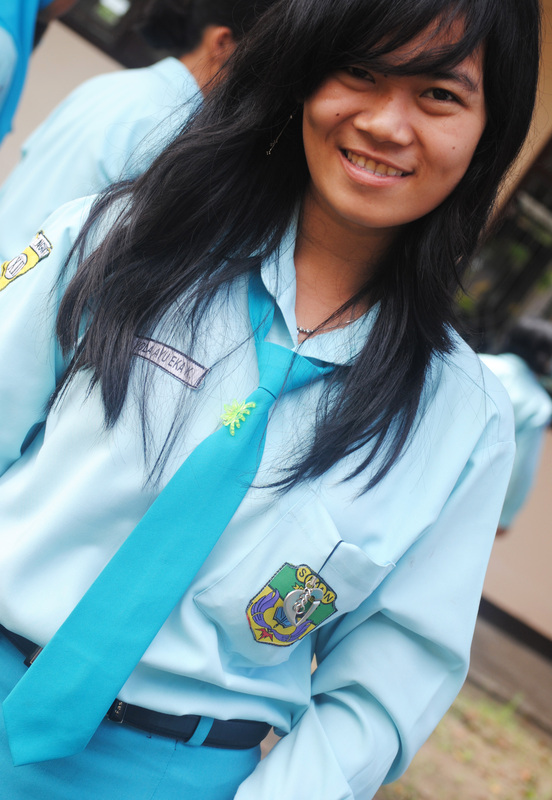 She isn’t just a serious student, she also loves to have fun and be social and discuss problems and think critically. 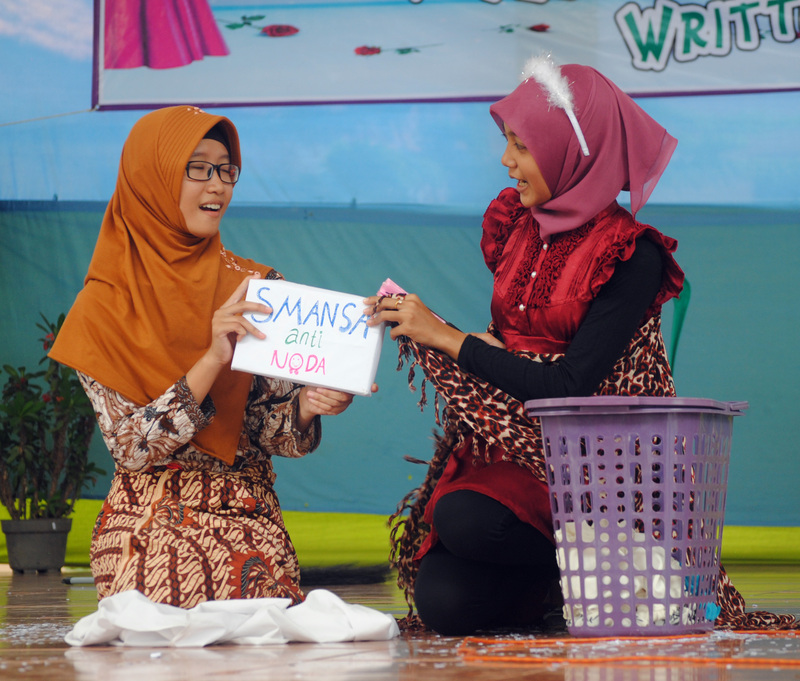 Last October she joined the same English competition that Joko joined but in the speech category. She worked almost as hard as Joko. When Bu Chris listened to her practice she told Awanda that she needed to work on her pronunciation and she should join my speaking les. Wanda did just that; she practiced with me, she joined speaking les and she won first place in the speech competition! Yesterday during speaking les we were discussing strengths and weaknesses (like a question you might receive in a job interview or on a scholarship application). Wanda said one of her strengths is trying new things. She told me that she had never done anything like iGLOW or a speech competition before but when she heard about them she decided she wanted to try them. She didn’t even practice for that interview that so impressed me a year ago. I feel lucky to know Wanda. I think when she sets her mind to something and gives it her all she is often successful. I’m excited to hear about what she does in her post-high school life. As I mentioned at the beginning of this post, speaking les is my favorite weekly activity. That’s a huge change from last year. At this time a year ago I was mulling over the all the things I wanted to do but didn’t know how to do at site. I wanted some kind of informal club or group that would be my secondary project where I could pour my passion for non-English-related subjects like youth & community development and volunteerism. I wanted to talk to kids about social issues and push them to think critically. I also wanted to get to know my students on a more personal level. I was frustrated feeling like I had no way to accomplish these things. Fast forward a year and I feel like I’m finally seeing these dreams realized through speaking les and iGLOW. I’m so grateful for both of these activities and most especially for the students that I’ve highlighted in this post. A few weeks ago my school hosted our second iGLOW Day. 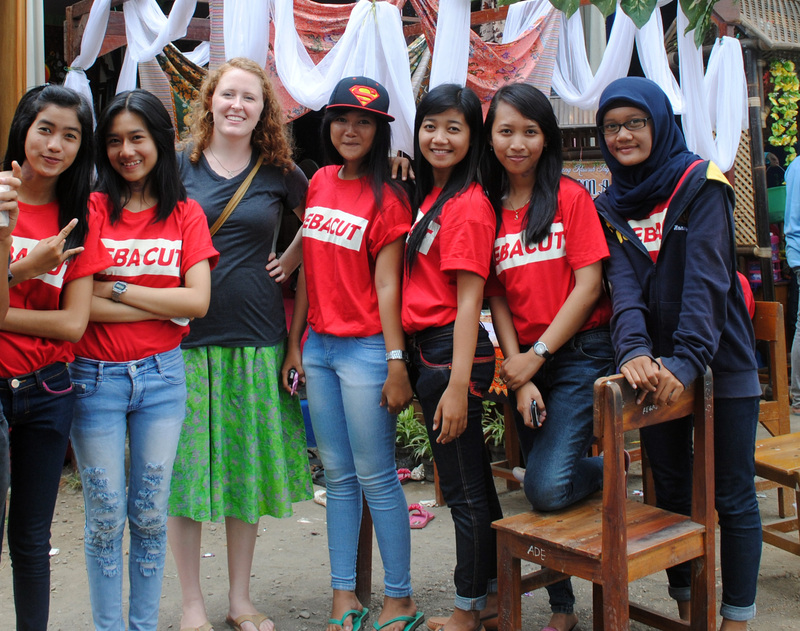 Last year, eight of my students joined Camp iGLOW in April. When they got back they were ready to share what they learned with the other students, so we had a day-long activity where they led some of the same sessions they had participated in during the camp. Around 30 girls joined Hari iGLOW (iGLOW Day) and we ended the day with a brainstorming session about what we would do in the future. Then we took a break for a couple months since it was the end of the semester, break, and Ramadan. Finally we kicked things off again. The previous participants met with my counterpart and I and decided to 1) meet as an informal club and do activities that focus on learning (inviting guest speakers, watching videos, etc) and doing (volunteer activities, raising awareness, etc) and 2) include boys. Inspired by Melanie and her school, we officially changed iGLOW to mean Indonesian Generation Leading Our World (previously the G stood for girls). The reason we want to include boys is not to take away from the important message of female empowerment. On the other hand, we want to make our efforts for female empowerment more successful by teaching men to respect empowered women and we want to teach boys and girls to work together so that ALL can be strong leaders. There’s been a lot of great work done in other camps and other countries focusing on this male role, including this Camp BREW (Boys Respecting Empowered Women) in Cambodia. And last but not least, the boys at my school asked to join iGLOW. I figured if there was interest, why not give it a shot? So we held our second iGLOW Day for male and female students, especially for the new 10th grade students and the boys who hadn’t yet had a chance to participate in iGLOW. My counterpart Bu Chris and I didn’t want to just repeat the same topics we had last year because that would be pretty boring for the iGLOW veterans. Instead we decided to mix it up. Our topics included Choosing Friends Wisely, Healthy Relationships (including dating/romantic relationships, understanding what is an abusive relationship and how to protect yourself), Self Confidence, Finding Your Talent (Calling), Decision Making, Goal Setting, and Human Trafficking. It was a whole lot to talk about and unfortunately we couldn’t count on our students presenting since the topics were new for them. Luckily Bu Chris has an excellent network of SMAN alumni (her former students) that she calls on whenever she has a task she thinks they can help with. We invited a handful of alumni and they invited a handful more and we ended up having around 7 or 8 alumni join. 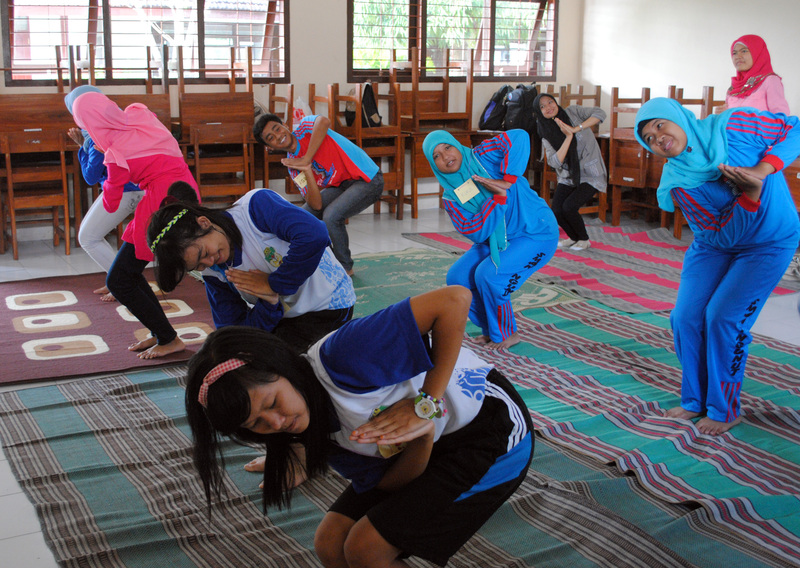 We started the day with yoga, by request of the students. I am certainly not qualified to be a yoga instructor but it was fun to show the students a few poses. How they managed to do yoga in jeans, I’ll never know. (I did tell them to wear sports clothes!) Next we had introductions and icebreakers. We played the Human Knot game which was a lot of fun and really successful. Plus it makes for a great photo opportunity. Each student was given a name tag and a workbook when they registered. The workbook (which my students were gracious enough to help me put together during a particularly stressful moment the day before iGLOW day) had a page corresponding to every session with reflection questions and material we wanted the students to read at home. Our first session was Choosing Friends Wisely. The alumni all shared their experiences during high school. Some of them had felt peer pressure and were not confident enough to make friends with the students who would support them and encourage them to do their best. Instead, they hung with the cool crowd. Other students recognized that their friends would influence them so they chose to spend time with the smart students. Others just didn’t care. They were who they were and they were proud of it. From there we transitioned to talking about dating. The boys (all two of them + the alumni) and the girls split up and made posters detailing the characteristics of their ideal partners. The groups presented and had to answer questions; what would happen if their partner didn’t have this characteristic? The groups were given different scenarios: imagine if your partner planned to join you for a meeting but he/she was more than 45 minutes late. How would you respond? We discussed how to respond passively, aggressively, and assertively. Then we discussed scenarios where abuse takes place. My counterpart did a great job of explaining why in those instances you need to protect yourself and not put up with abuse. We watched a video case study about an Indonesian celebrity who was abused by her boyfriend and put up with it for a long time before she finally came forward with the situation and publicly broke up with him. We discussed the progression of abuse and gave the students warning signs of abuse and steps they can take if they think they (or a friend) is in an abusive relationship. After that heavy topic we had a short break and then we continued to self confidence. 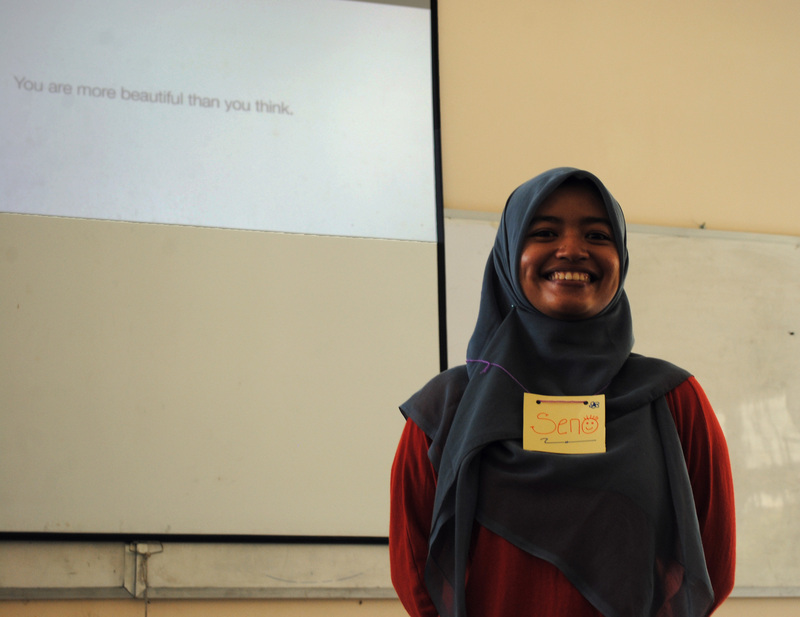 Seno encouraged the students to practice self confidence, even if they feel shy. Then we had some improv skits, as a way to practice speaking in front of people and breaking out of our shells. The twelfth graders were up first and they did a great job. They had to act out a skit where the characters were romantically invoved. Usually students are embarrassed by that and will giggle shyly and refuse to act. I was so proud of my students. They weren’t afraid to be silly and they showed a lot of confidence. If we had done this a year ago I know it wouldn’t have been the same. I’ve seen these students grow SO much in their self-confidence this year through personal interactions, in English Club, and in iGLOW. I didn’t plan the skits but it was one of my favorite parts of iGLOW Day because it was a clear picture of how my students are changing and growing. 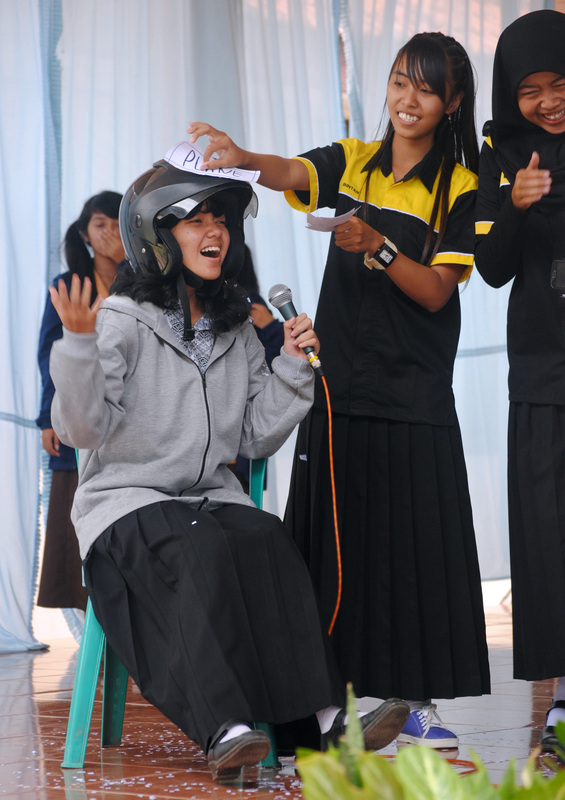 Then we had the tenth graders do a skit based on the Cinderella story. The girls were pretty shy and quiet. The difference between the two skits was clear. Rather than criticizing the younger students the older students gave them motivation. They told them that when they were in tenth grade they were also quiet and shy but that as they practiced public speaking, joined dramas, and joined iGLOW, they overcame their fear and grew in their self-confidence. The Finding Your Talent session was rushed, since we were behind schedule, but it was a chance for students to think outside the box about future career opportunities. Many students aspire to become teachers because, when faced with the “what will you do when you grow up” question, a teacher is a respected position in the community and it pays well. And, maybe, they also answer “teacher” because they haven’t learned to dream beyond the obvious. Don’t get me wrong, being a teacher is an excellent and important vocation but it isn’t for everyone. One of the alumni who joined is a graphic designer. Another just graduated with a chemistry degree. I hope their stories helped students to start dreaming big. Next was one of the best parts…eating together! Every time we have an iGLOW activity at school we eat potluck-style. Each student brings something to share and Bu Chris (or this time, one of the students who lives nearby) brings the rice. Then we share everything. It’s simple and free. 🙂 After lunch we did a “Cross the Line” activity. I wasn’t sure if this activity would be successful but it ended up being one of my favorite parts of the day. Everyone lined up on one side of the line and Bu Chris read a sentence, “Cross the line if….” Each time she gave a different scenario that related to the iGLOW material (you have a boyfriend or girlfriend, you have felt not self-confidence, you like talking in front of other people, etc). Each time some students crossed the line while some stood still. Then they had to chance to share about their experiences. Some questions got pretty personal, such as, “Cross the line if you have ever experienced any kind of abuse in a relationship.” One very brave soul crossed the line for this question and was willing to share about her experience with some emotional abuse. Other interesting scenarios were “Cross the line if you have ever tried to do something and failed,” followed up “Cross the line if you have ever wanted to try something but have been too shy or scared to do it.” I had not planned on participating but I surprised myself by jumping in and sharing about my own experiences in high school (failing to win the college scholarships I applied for and never trying out for a play in high school though I secretly wish I had done that). After the questions we all debriefed the activity. Bu Chris and the students were all surprised that I had failed in my attempt to do something or been too scared to try something new. 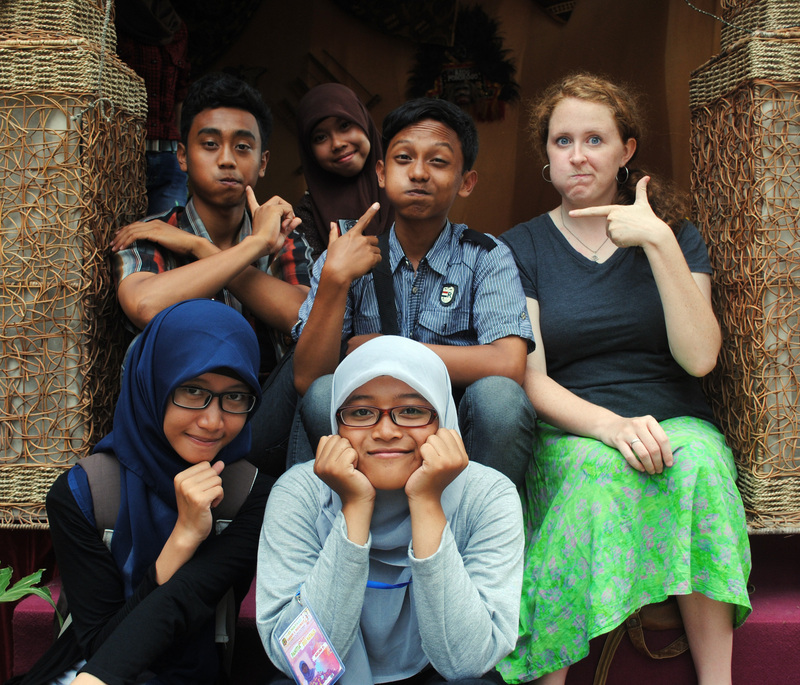 They reassured me, though, that I now have plenty of drama experience, thanks to my time in Indonesia. After all, I’ve already been on local television when I acted in ketoprak last spring! Our afternoon sessions were Decision Making and Goal Setting. Our alumni led us in a decision-making activity. We were split into small groups and given a scenario with a character who was balancing family, school, social, and extracurricular activities. It was very familiar to my students and me. We had to make priorities and choose how to balance our time. 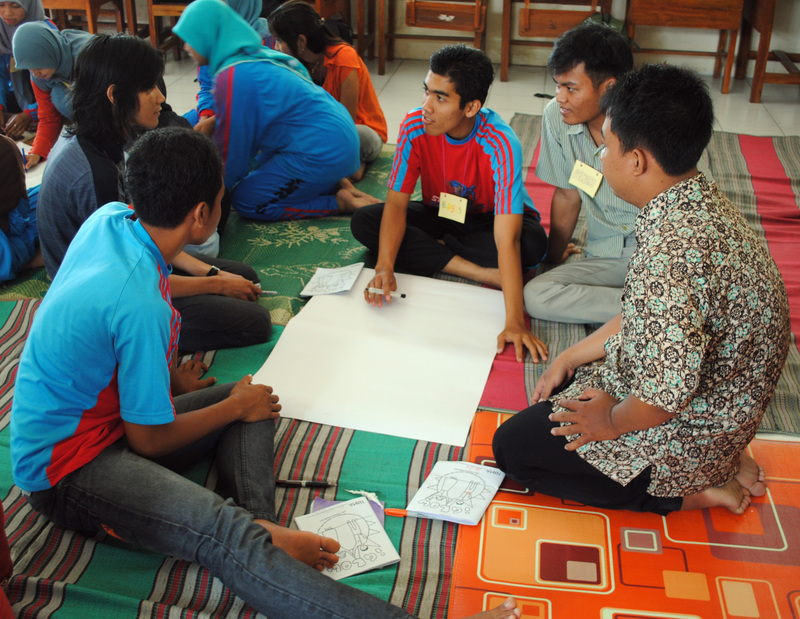 I jumped in with a small group and discussed, all in bahasa Indonesia. I liked being included as a participant; my group included students, an alum, and me…but it felt like we were all equals. The age difference and cultural difference didn’t really matter. Goal Setting was closely related with Decision Making. Students formed new groups and went through the process of setting a goal. They had to identify the goal, where it would take place, who could help them, when it would take place, how they would go about reaching their goal, and finally, they had to describe why (what was their motivation). Each group presented their goals and then they had a page in their workbook where they could create an individual goal to accomplish in the following year. 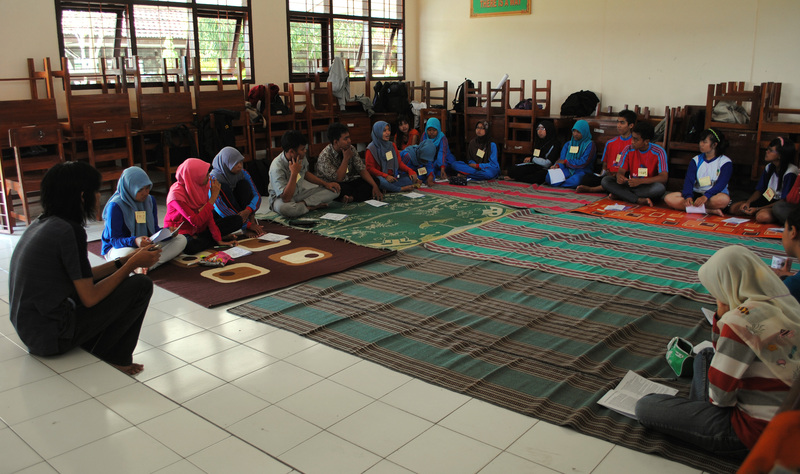 Finally, we ended the day with a session about human trafficking. It was a little abrupt switching from sessions that were all focused inward on developing the individual to a topic that we hope will never affect any of the individuals! Bu Chris was as creative as ever and she had the idea of making a board game as a way to share the information about human trafficking (an idea she borrowed from Peace Corps training sessions). We opened with watching a video about an Indonesian woman who had been trafficked and then we played a game in groups where students were asked true or false questions about human trafficking. Even though students were tired, the game was a hit. The day ended with a short journaling session. Students wrote about the things they wanted to remember from the day and the material that was most important to them. Then they wrote a letter to themselves for six months from now. 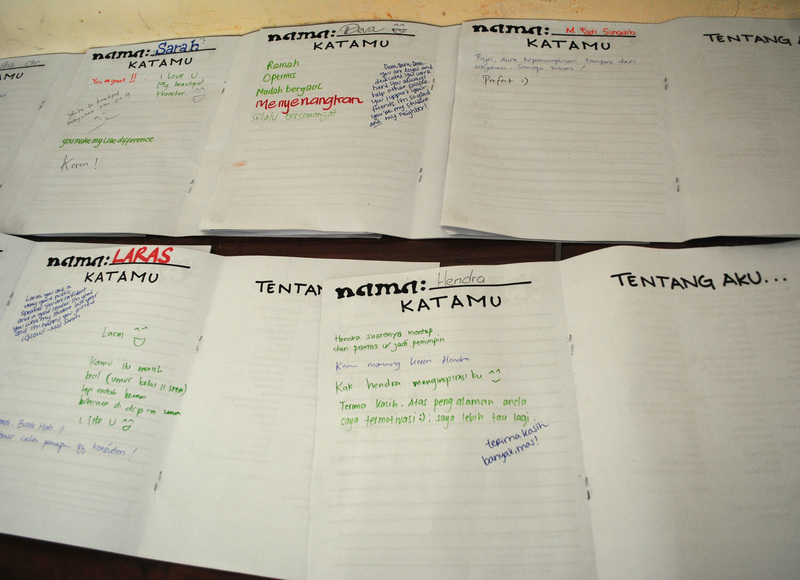 They had to write their personal goals and dreams to their future selves. Everyone was getting antsy by the end but after reading the iGLOW commitment, they were more than willing to prolong the day if it meant a photo shoot. A big shout out to Amy (fellow PCV) who let me use her adorably spooky leftover decorations from our PCV Halloween party the week before. Click on the photo to check out Amy and Will’s blog. 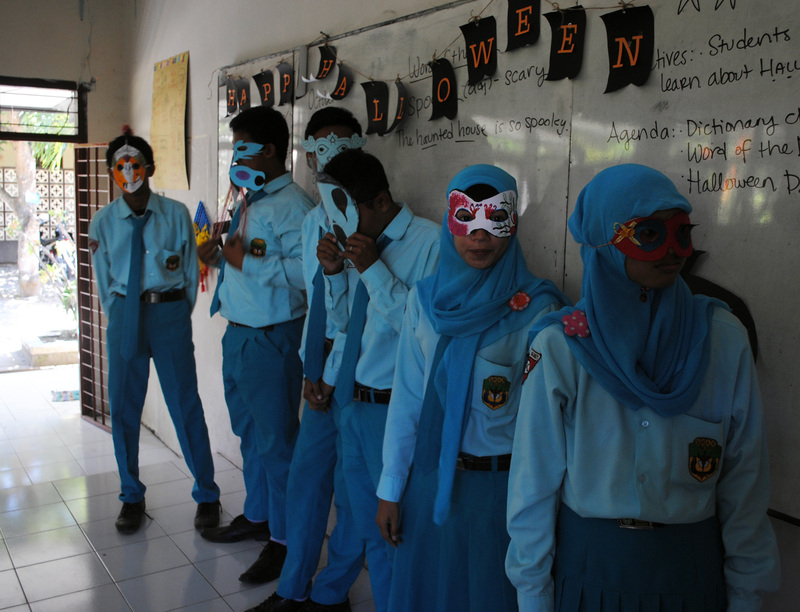 You may remember from last year that I held a Halloween party with the only class I taught on October 31st. Well this year it was practically expected and I was excited about it. I had two classes and English club on Halloween since it fell on a Thursday. That meant three back-to-back parties which is a whole lot of celebrating for the holiday that I actually like the least (when I’m in the States, anyway…it’s much more fun here when I get to plan the celebration without stressing over a costume). 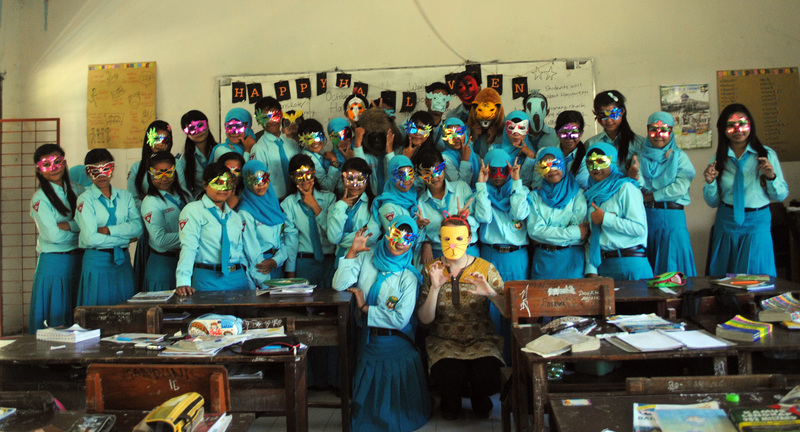 We asked all the students to bring a mask to class as a way of dressing up. 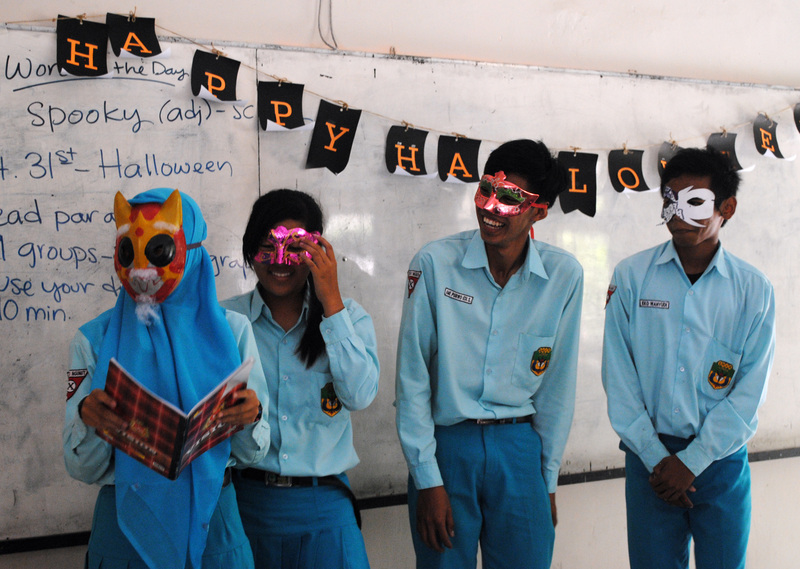 Costumes were out because all the students wear uniforms and masks are easier, anyway. 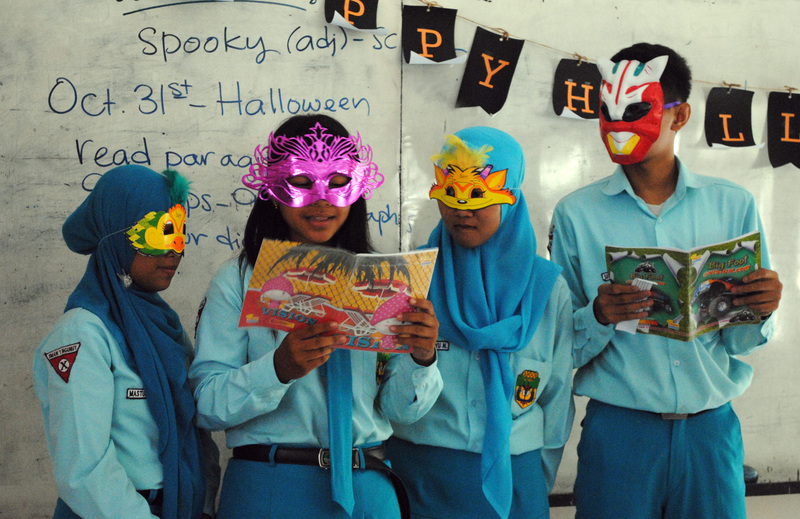 A lot of students opted to buy pre-made masks (I’m curious where they found them…) but some were really creative and made their own. 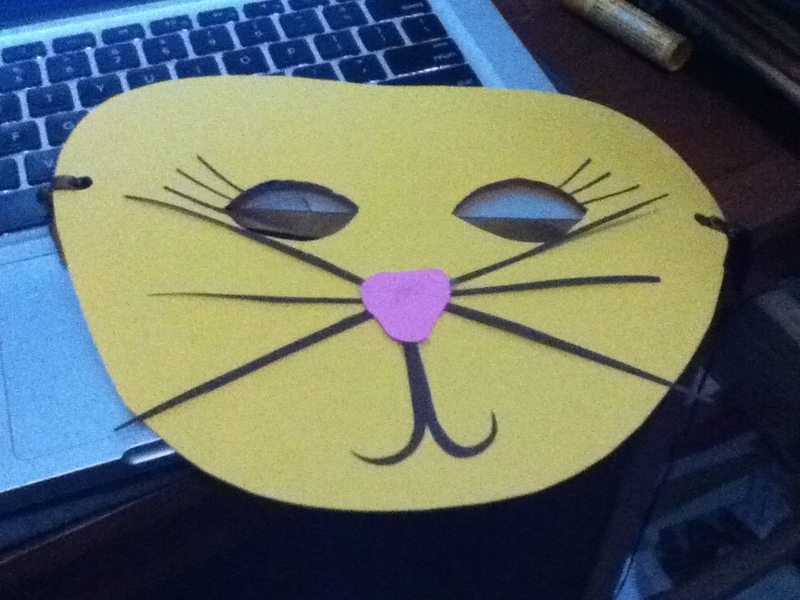 We had a contest for the best homemade masks and the top three winners got cash prizes! (all less than $1 but still). Class started with our “word of the day” which I do everyday to teach students a new word or phrase in English. I teach a lot of idioms, common phrases, and some slang (for example: take care, fine by me, costs an arm and a leg, cool, etc). The word for October 31st? Spooky. Then we split the class into groups and gave each group a short paragraph to read about the history and traditions associated with Halloween. I’m completely indebted to HowStuffWorks for all my information. I learned a lot that I didn’t know before, and I was most interested in the Celtic holiday that preceded Halloween, the Celtic New Year known as Samhain. Read more about it here. 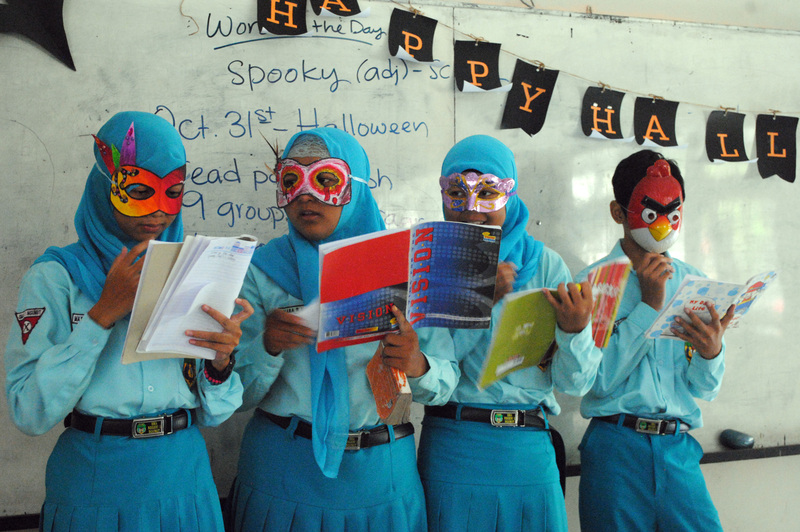 Each group read their paragraph and then had to explain it to the class using bahasa Indonesia. After that we gave a short oral quiz to check if students had paid attention. The students with correct answers got candy, naturally.